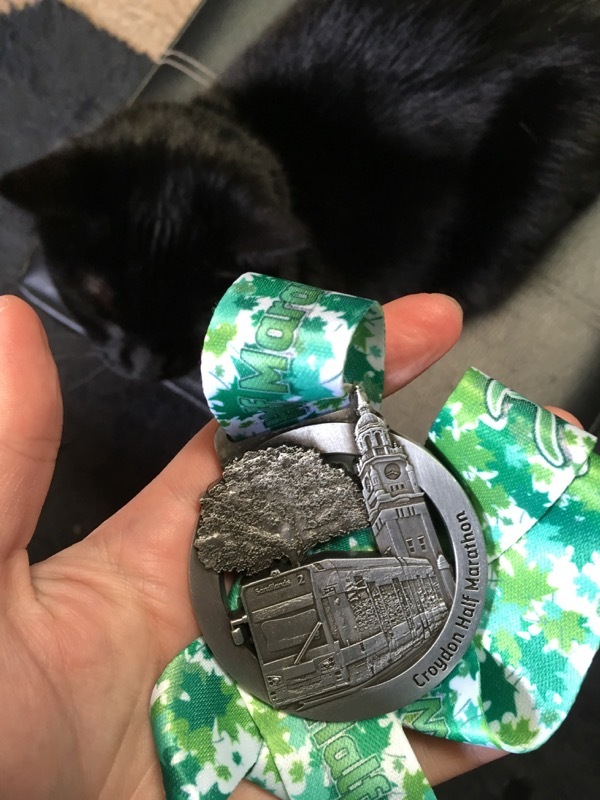 I had one goal for 2018 – qualify for Boston again so I could run it next spring to celebrate my 40th birthday. 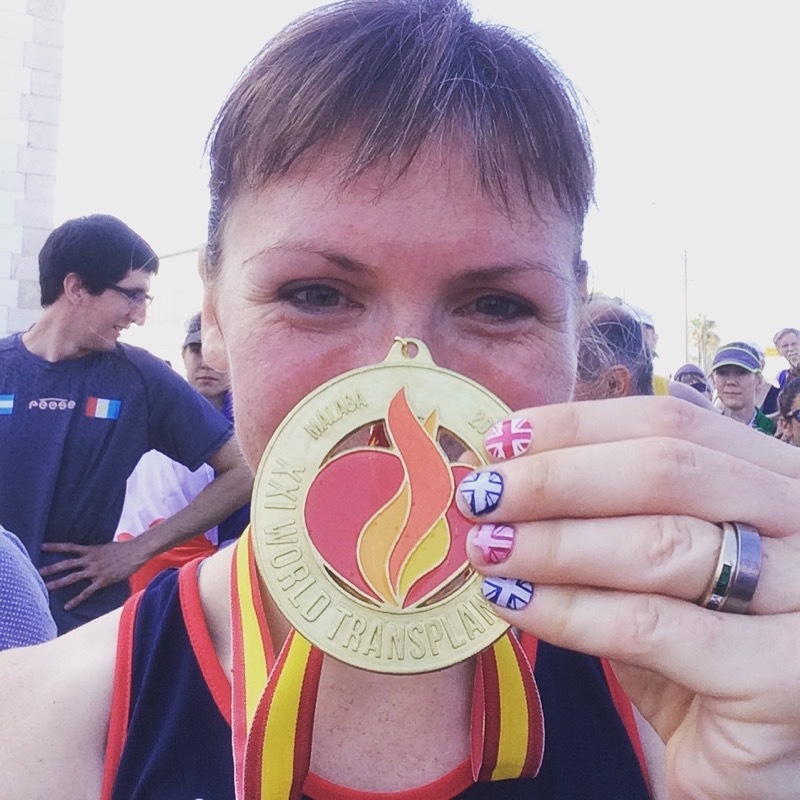 I’ve qualified a few times already, but never quite had the chance to actually run it, but with it being an off-year for the World Transplant Games and my marathon PB sitting untouched for the past 4(!) years, this was going to be my Year of the Marathon. And my training was going really well right up until mid February, too – good strength training, I was fitting in run commutes to work, and I even got down to my target race weight a few months early, too. At first, it was just the seasonal flu that went around my office. Seasonal flu, but one that multiple people told me was the worst they’d had in decades. So with my medical history, I determined that I’d probably be laid low for 3-4 weeks since it was taking normal people out for a week to ten days. 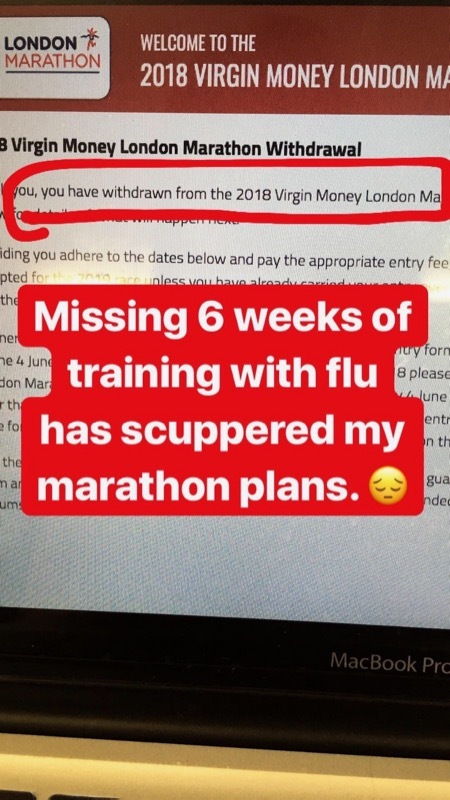 Six weeks later, and I was finally starting to feel about 75% recovered, but missing six weeks at the height of marathon training meant that I’d now have to defer my London marathon place (having already DNSed the Big Half during the height of my flu) and I started looking around for other options over the summer to qualify before the Boston cutoff in mid-September. And I’d just signed up to run Reykjavik marathon in August when I started to feel very, very unwell all over again. This time, it turned out, I’d come down with three other viruses simultaneously, all three of them very long-lingering and particularly nasty. Culprit one – Parainfluenza. Despite the name, it’s not actually a type of flu, it can hang around for months, and knock you absolutely flat. And there’s no treatment. Culprit two – Adenovirus. Apparently there is a treatment for this one, but you’ve got to test positive for it in more than one area of the body to qualify, and I (only) had it in my nose/throat/lungs, which count as one place. 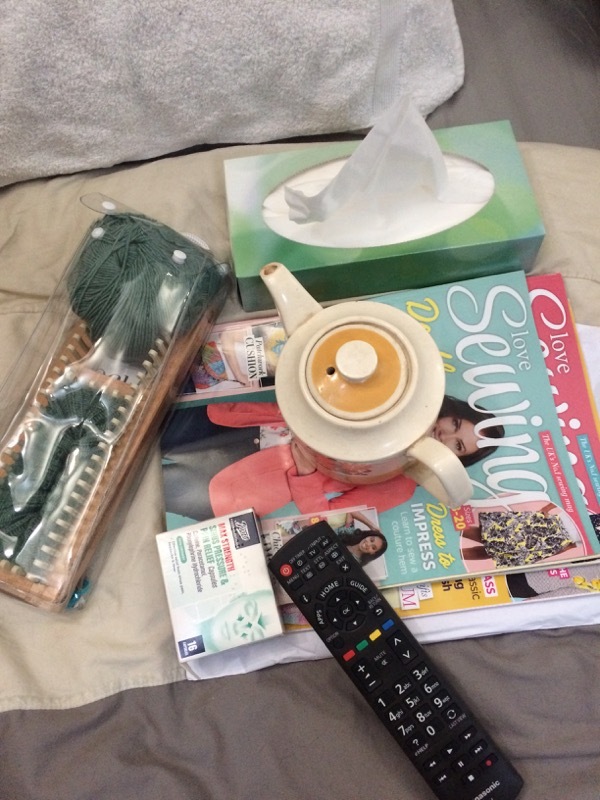 Culprit three – my old pal the Epstein Barr Virus, aka mono, aka glandular fever. Nearly everyone has EBV laying dormant inside them at all times, but only special, immunosuppressed flowers like myself get to experience the joys of multiple EBV reactivations (for long-time followers, this is what took me out of action for 3 months in 2016). So if you’ve ever had, or known anyone who’s had mono/glandular fever, imagine having that for, ooh, three months on top of two other nasty viral infections, after six weeks of horrific flu, and that’s been pretty much the whole of my 2018. I literally couldn’t get out of bed for days at a time, let alone go to work or anything social, and even just walking to the corner shop took an extreme amount of effort that would leave me in bed for the rest of the day. It was so bad that I had to get a “Please Offer Me a Seat” badge for the bus, as I couldn’t stand up for more than about ten minutes. I was beyoooooooooooond bored, beyond frustrated, and literally so jealous of everyone who was simply getting on with their life that I felt angry all the time, too. Eventually, after being monitored, swabbed, tested, and spending days in hospital (having to fight not to be admitted at one point! 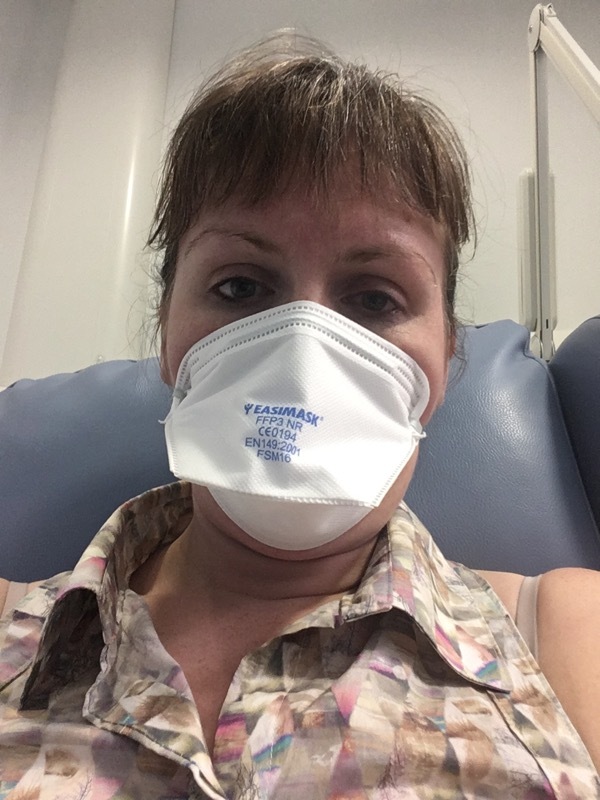 ), I eventually convinced them to give me the treatment for EBV, because I was simply not getting better on my own, and I had waited more than long enough. The treatment for EBV is Rituximab, which is actually a pretty cool piece of bioengineering – they take mouse cells and graft human receptors onto the outside, which then bind to your lymphocytes, which are then targetted and killed by your immune system. Rituximab is given for a wide variety of auto-immune disorders, but since EBV lives inside your lymphocytes, it also works for that, too. And by “works”, I mean, it kills off half your immune system while also killing the virus. Yay. 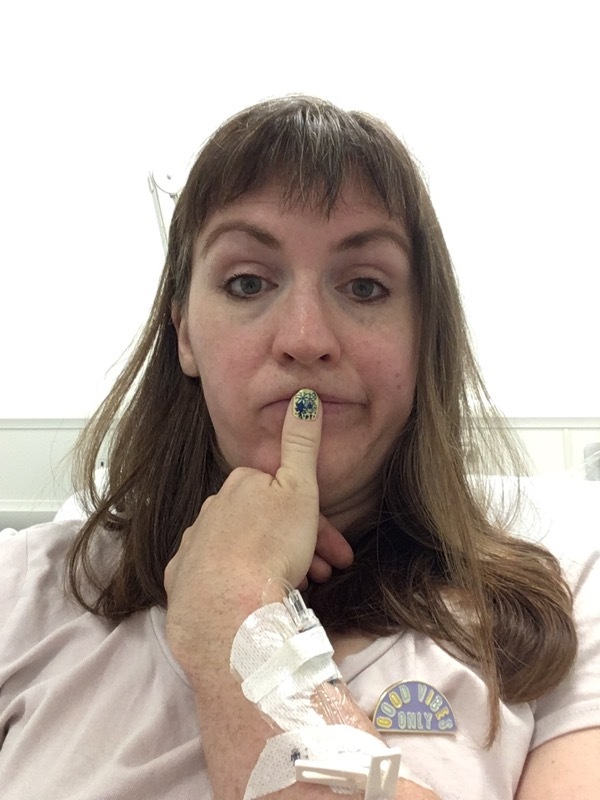 But at this point I would’ve drunken yak vomit if someone had said it’d make me feel better, so off to the chemo day unit I went, every Tuesday in June (and then into July, after the parainfluenza came back for a week and they postponed a treatment). Oh yes, they can give you chemo for a viral infection! Rituximab may not make your hair fall out, but seeing as how they’re pumping animal cells all around your veins, people have a tendency to react badly to it the first time. I thought I’d be safe, since I was given it for my first EBV reactivation right after my transplant, but no, four hours into the first dose, and I started to feel the cotton ears, dizziness, and weird vision that I recognised from my years of reacting to platelet transfusions, so I slammed my hand on the nurse call button. The nurses paused the treatment, gave me two lots of IV piriton while they watched my blood pressure recover from a low of 80/40 (no, that’s not a typo). After an hour’s break, they restarted it, and another four hours later I could finally go home. Luckily the other three doses were uneventful, and by the start of July, I actually started to feel a bit more energetic! 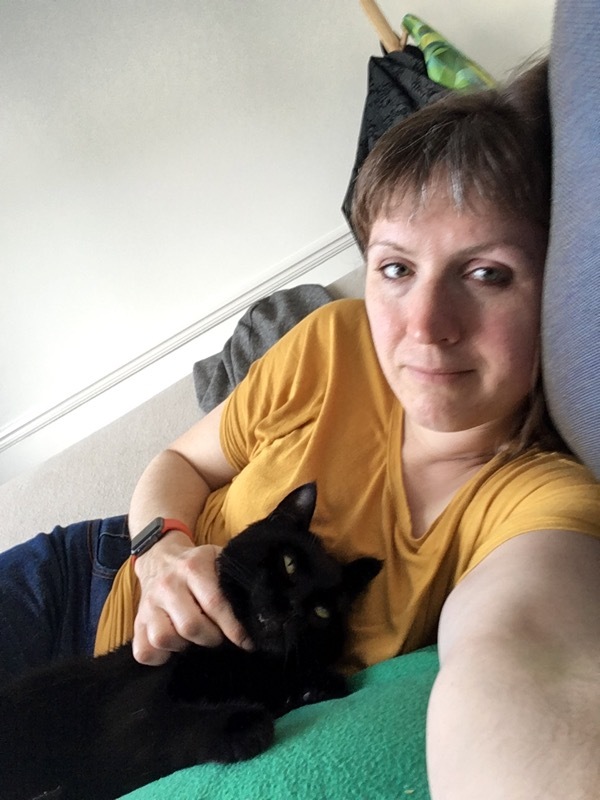 Like, I could walk places and not need a lie down, and I could finally do a full day’s work, and I could cycle commute without feeling utterly awful (as an aside, taking it really slowly on the bike was WAY less energy and stress than taking a rush hour train). But not enough to ride 100 miles on a bike this weekend, so my ballot place for Ride 100 has also been deferred for next year. So I’m at the point now, in mid-July, that I actually feel about 80% recovered, and I went for my first run back this week – a nice 5km around my local cemetery/park. But this does mean that I’ll be lucky to even run the 10km in Reykjavik next month (they host the marathon, half, 10km, and fun-run on the same day and you can switch between at the expo). 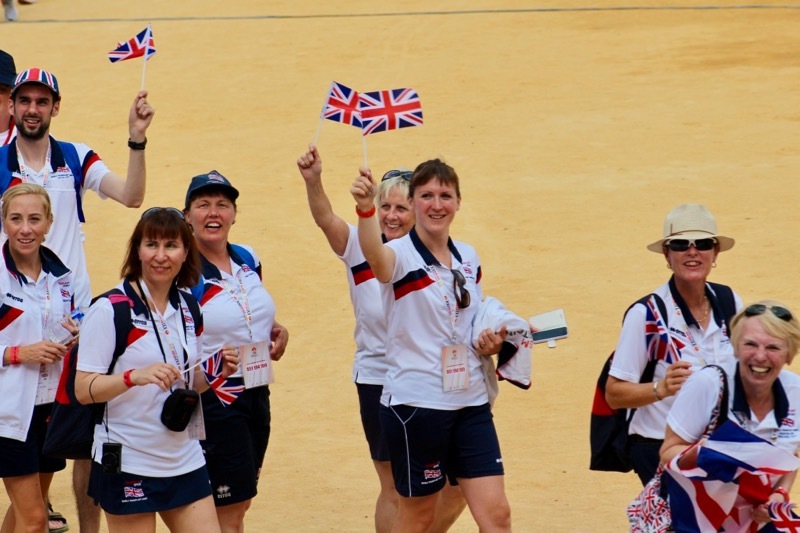 And likewise, no British Transplant Games this year for me, as I was too sick during the registration period to have any hope of passing the physical. And the dream to run Boston next spring is over, as there’s no way I can rebuild from this and qualify in time for September. And more than that, I feel cheated out of 5-6 months of my year. I was sick during the “Beast from the East” blizzard, and I was still sick during the heatwave, for godssake! And the punchline to all this? I’d actually had the flu jab. …And that’s completely natural! If you’ve cared enough about a race to train for it, devote weeks or months of your life to thinking about your training and strategy, and worrying over every little aspect of it, then it makes sense that after it’s finished and the high fades away, you’re left with a bit of a “well what now?” feeling. So I’m going to first tell you that you need to rest and recover, both physically and mentally. The length of this period will vary based on the length of your race, your age, running experience, and general physiology. In general, after a marathon I’ll take a full month off training before I go back into any serious speedwork or long runs, but equally it may well be less or more for you depending on what your heart rate is telling you (you do keep an eye on your resting heart rate, right??). So take lots of rest days, slob around at the weekends, go for long brunches, and go to bed early to top up on sleep. Take the extra time to do some cross-training if you like – yoga, pilates, and swimming are all good pursuits that you’ve probably neglected while focused on your race, so go and get yourself reacquainted now that you have the time and you feel like it. 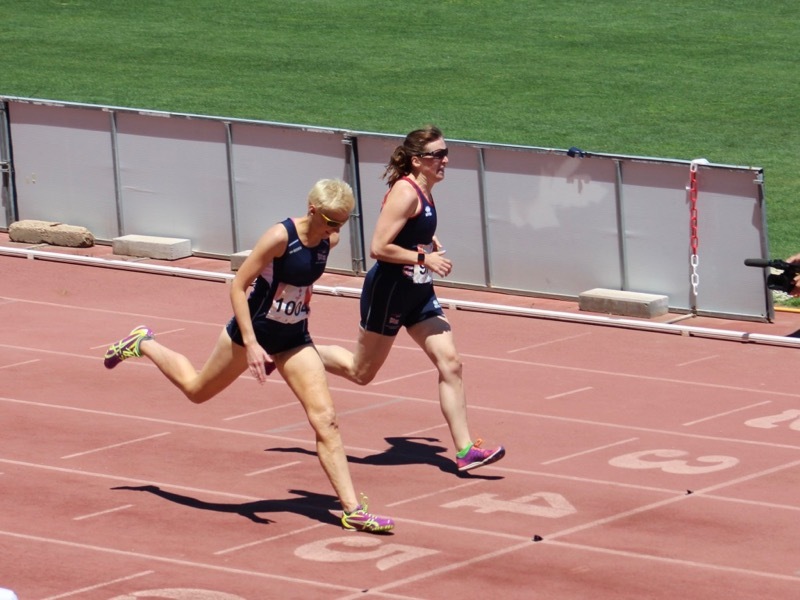 But the length of physical recovery may be faster or slower than your mental recovery – the time it takes for you to not only get excited about running again, but actually crave the structure that a training schedule brings. So for me, this means that I’ll step down to a slower group at Run dem Crew and other group runs, both to preserve my legs a bit but also to give back to others and enjoy the process of chatting without struggling for breath. It’s nice to mix with a different set of people, but also to help encourage others who can’t really keep up their side of the conversation without difficulty! 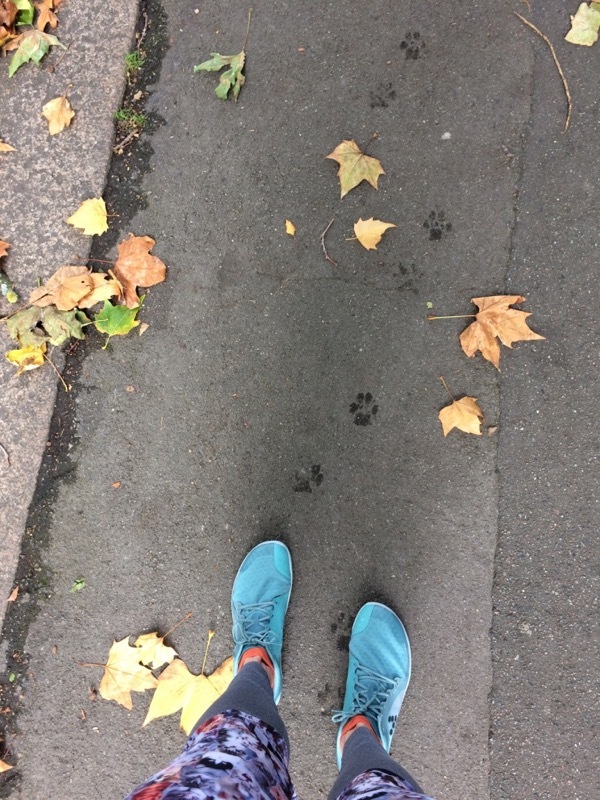 But even on my solo runs, I’ll run fewer sessions in the off-season, and frankly, if I get up in the morning and don’t fancy going for a run, I don’t go. It doesn’t happen often, but there’s no point in trying to force the mojo when there’s not even an end goal, and it’s probably my body’s way of telling me I should focus on other things for a while. Even when I do head out for a run, I try not to be too prescriptive with myself on how far or at what pace I’ll run. I like to keep most of my runs at a low heart rate (Maffetone style! ), but instead of having the stress of the watch beeping when I go a beat over 140, I instead go for a less precise “mouth closed” approach and choose routes that allow me to vary the length depending on how I feel. So if you find yourself a bit lacking in running motivation after a big event, learn to embrace the off-season. It’s not smart or advisable to train hard all year long – I can’t think of a better way to encourage injury and burnout. 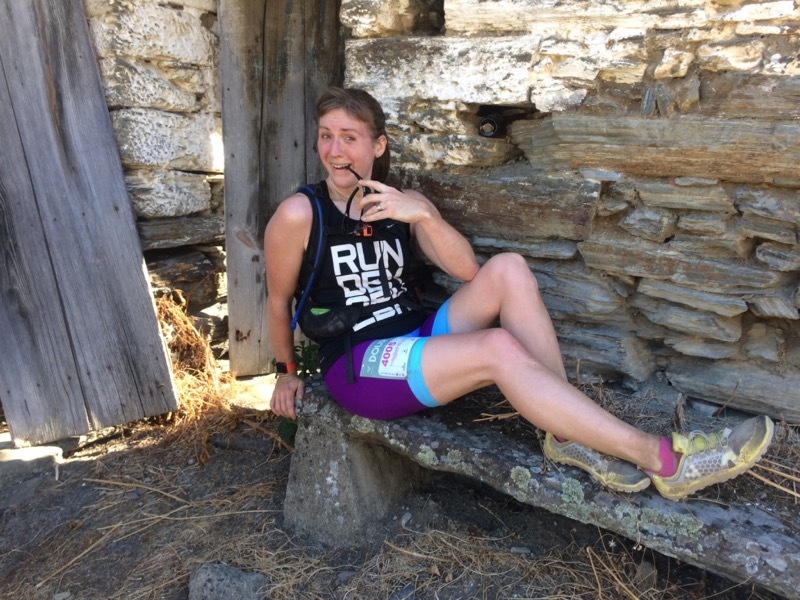 Having these periods of downtime are what allow us to train to our peak during the training phases, and you need both to become a well-balanced runner and person. This weekend I flew to northern Portugal to run down a mountain, and it had been three years in the making. You may remember that back in 2014 I ran the entirety of Berlin Marathon with a guy named Luis who I only barely knew at the start, but by the finish line had become my brother. For the past three years he’s been trying to convince me to come and visit him in Porto, and this year I finally made it over, with my friend Alex in tow. 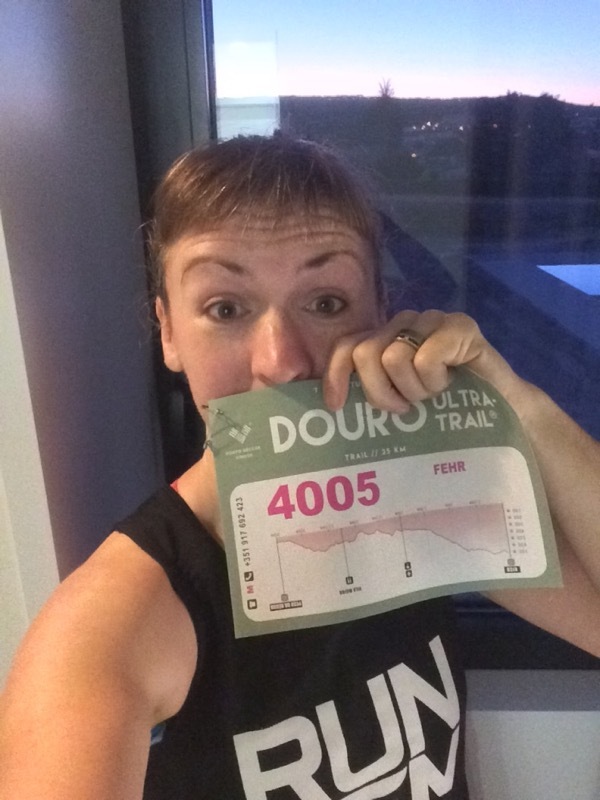 I chose the Douro Ultra Trail race from a shortlist of Luis’s suggestions because the scenery looked beautiful, there was a 25km option (as well as 15km, 45km, and 80km) which seemed to be a good distance for having a good chat and not suffering too much. 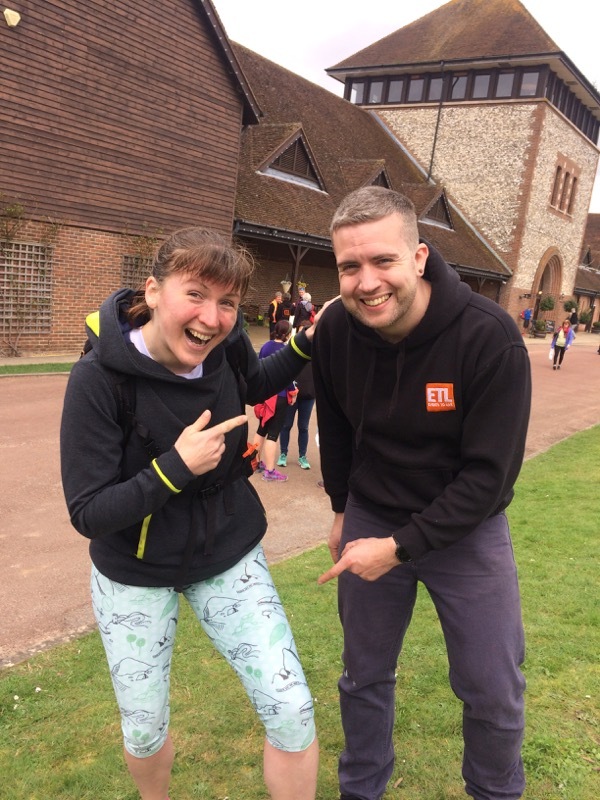 Alex has only been running for about a year and never raced a half marathon before but was keen for an adventure, which seemed to be the right spirit for this race! I signed up over the summer, when entries for the 25km were a bargainous €20 (plus an extra €3 as I wanted the long-sleeved race tee). I honestly don’t know how they can put on a race for so cheap, as we ended up with the aforementioned technical tee, huge feed station, decent race medal, and a bottle of local wine, too! Having arrived in Porto on a delayed flight, we only arrived at Regua just as the pre-race briefing was starting, and to our amusement, was entirely in Portuguese! Luis and his friends translated what we needed to know, which was really only that there were some irrigation holes about 4km into our race that we needed to be aware of (in reality, the other runners were great about shouting out and indicating at each of them). Everything else was really already stated on their Facebook page and website, so if you’re travelling to this race in future years, don’t feel like you need to kill yourself to get to the briefing on time. We then headed downstairs to register, which was super quick and casual – each of us got a bag with our number (& timing chip), race tee, apple, and some local honey boiled sweets (hard candies). Our group then headed to an extremely nice local restaurant for dinner then to our hotel just before their midnight cutoff, ready to wake up at dawn to make the coach to the start in time. 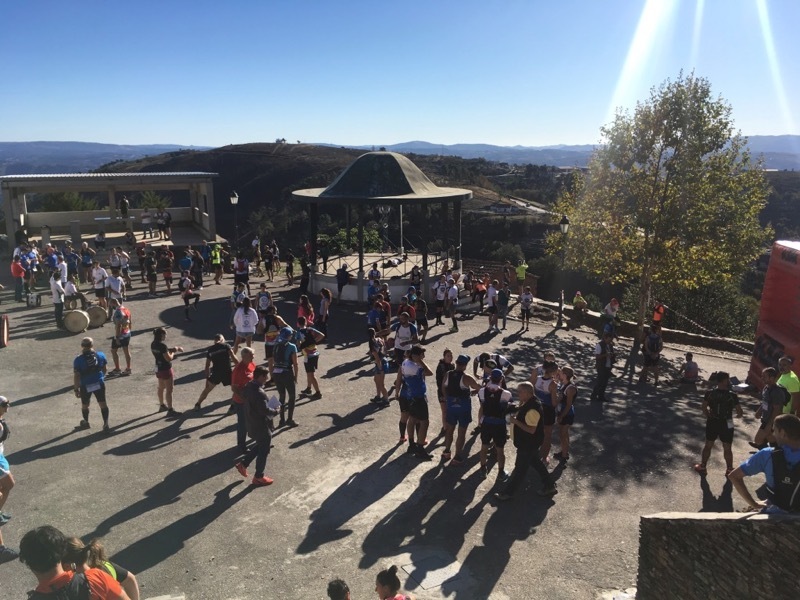 The ultra course is circular, beginning and ending in Regua, but the other distances start at other points on the route, with coaches ferrying runners to the start. 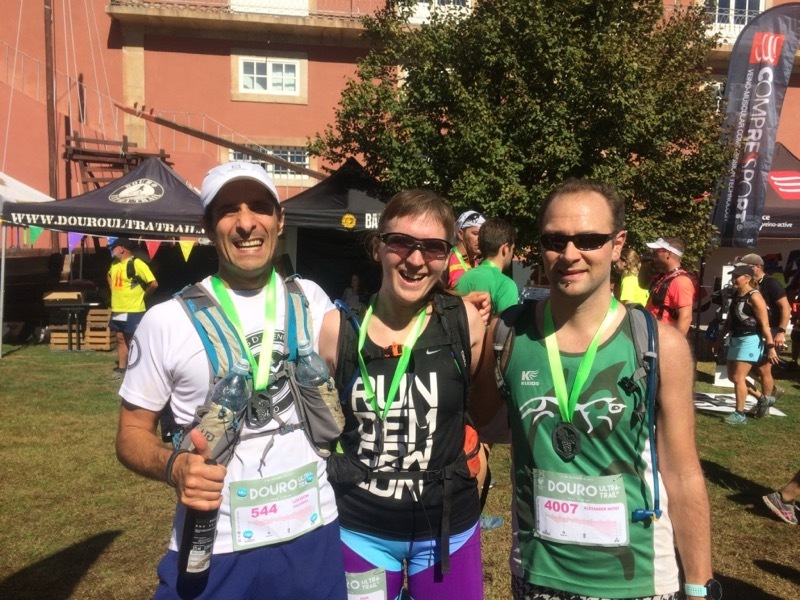 The coaches for our race were super organised, each setting off once full and taking us up hugely steep and very narrow winding roads to the top of a mountain (making me very glad I didn’t choose the marathon or ultra races!). At the top of the hill was an open area with scenic views, bandstand, toilets (with no queue, omg!! ), and two groups of traditional Portuguese drummers giving the whole thing a bit of gravitas. After basking in the morning sunshine for a half hour or so, the starting firecracker was pulled, and we were off downhill! And downhill… and downhill… actually, the first 10km were almost entirely downhill, with a mix of loose rock, scree, pavements, and even thick, fine dust that wouldn’t have been out of place in the Sahara. Alex brought along his gaiters, which I thought were ridiculously overkill but actually worked out great, and I’d recommend them if you have them. The course elevation for the route this year looked to be almost entirely downhill or flat, but in reality there were still a LOT of hills. Not just steep hills, but downright ravines in places – I lost count of the number of times I had to use my hands to steady myself on trees, rocks, and the ground itself to scramble up or down a hillside, with only a few places having stone steps carved into the slope to help us out (and again, glad I wasn’t doing the ultra, where runners would be negotiating these in the dark!). 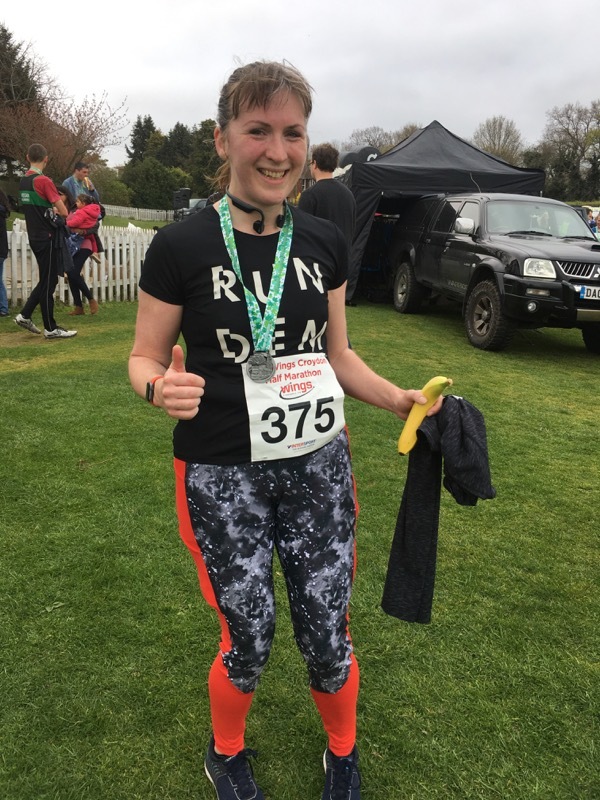 The result of the first 10km was to exhaust the brain, having to concentrate continuously on where the next footfall should land as well as attempting not to brake with your quads and knees (spoiler alert: my quads were wrecked anyway!). We went through several small towns along the way, wound through narrow, steep, and terraced vineyards, and absolutely stunning vistas. My photos don’t really capture the full beauty of the Douro Valley – every single scene we saw as we turned a corner could’ve been sold on a postcard or printed in a coffee table book. Eventually we rounded a playing field and entered a larger town, where crowds of people lined the streets – we’d reached the start of the 15km “hike” option, where we got a boost from the runners waiting to start their race, but apparently missed the water stop that must’ve been there (at least we had our CamelBaks – on such a hot day, many others also missed it and were caught short before the only other pit stop). 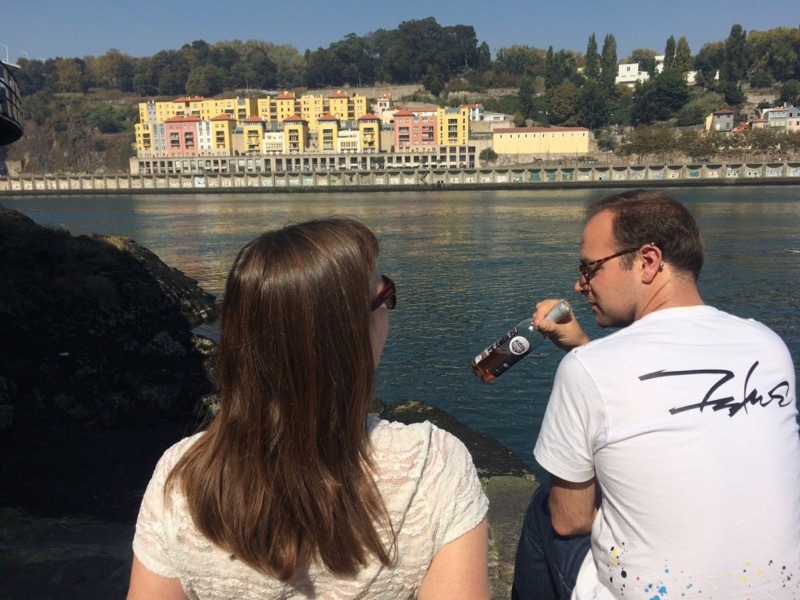 I’ve mentioned the heat, but it’s worth noting that it’s not usually 28C and sunny in October in the Douro – we hit upon a rare heatwave, so slathered ourselves in suncream, ran in our sport sunglasses and caps, and wore shorts and vests as a last celebration of summer. I wore my trusty Vivobarefoot Trail Freak shoes, which I hadn’t race in since the Transylvania Bear Race last year. These served me ridiculously well in the Transylvanian (and English) mud, but on the dry, dusty, and rocky Portuguese trails, something with a sturdier sole would’ve been a bit better (and I know understand why Vivobarefoot now make trail shoes for soft or firm ground!). In any case, Luis, Alex and I stuck together throughout the race, chatting to ourselves and the other runners throughout the race. I got very good at my two phrases in Portuguese (Hello and Thank you! ), and I really liked that even with a small field (350 runners on the 25km, plus some of the faster 15km runners), there were no real stretches where you were alone, and the course was incredibly well marked with plastic tape at regular intervals so you really only just needed to follow the person ahead, or glance to see the next piece of tape. 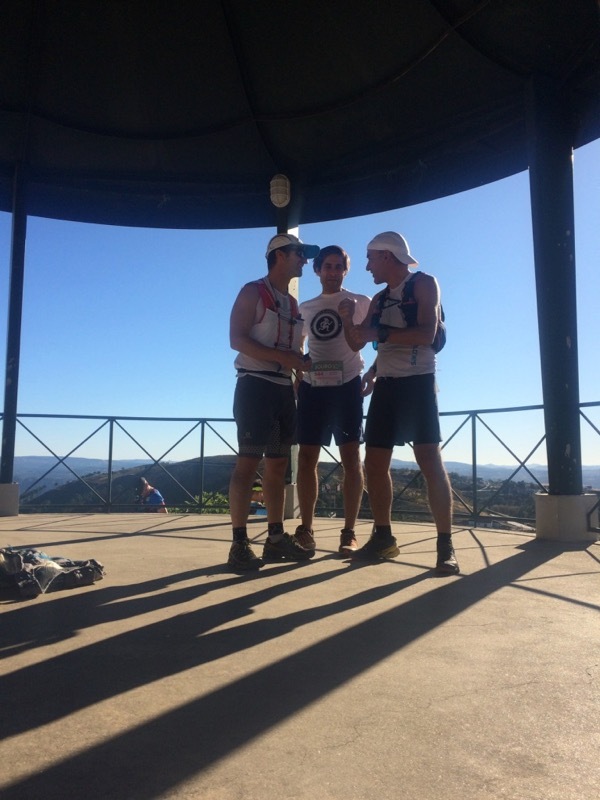 At the start, the three of us decided to take a casual pace, chatting, enjoying ourselves, and taking plenty of photos and GoPro videos to enjoy the day. There were definitely points where things got tough, but never any real low points where we stopped having fun. When we reached the only feed station at 16km, we filled our CamelBaks and set upon the impressive array of snacks with abandon. As a salty sweater, I went straight in for the crisps, but kept coming back to the watermelon slices, too. I swear watermelon has never tasted so good in my life, so I thank the local boy scouts who spent the whole time chopping up fruit in the feed station building! Feeling fuelled but not full, we set off to conquer the final few kilometers back down into Regua, and seeing the Douro River was a big boost, even though only minutes later the course cut through a large section of vineyards that had recently been burnt by the wildfires that plagued this part of Portugal. The whole race was a treat for the senses, but smelling the charred vines were in sharp contrast to the fresh air, flowers, and eucalyptus we’d enjoyed earlier in the day. 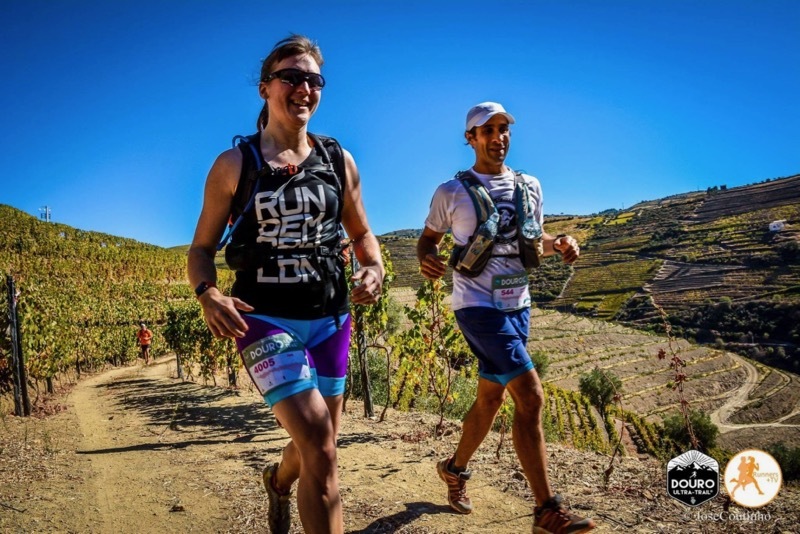 Several other races in the area had been cancelled due to the wildfires, and indeed, we witnessed a fire with our own eyes on the drive back to Porto, so this part of the race really made us feel thankful for the unspoiled countryside we’d witnessed for the bulk of the race. As we approached the riverside path, we looked at our GPS for the first time that day and saw we were several kilometers short, and were concerned that, even though we could see the race village, we’d have to loop around the town or something first. On reflection, our GPS measurements came up short because it’s measuring from the top down, as the crow flies. 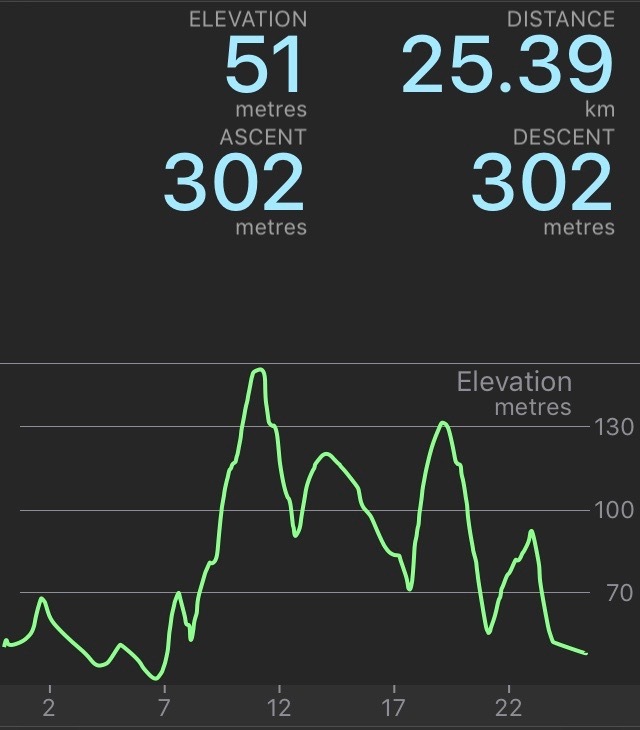 But we’d run through such elevation that the diagonal route we’d taken down and up created a discrepancy to the top-down view, meaning we’d actually run ~3km more than we’d tracked. 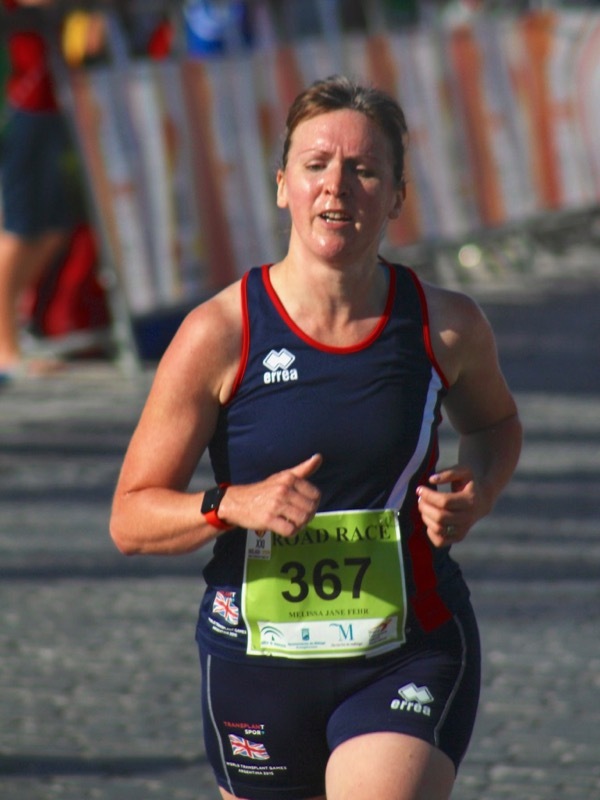 You can tell I don’t run mountain races often – this is probably obvious to many people! We crossed the line at the race village, were awarded our medals and local wine bottles, and immediately the emcee started interviewing me and asking about my race and my world championships and how my health was! Turns out Luis tipped them off that we were coming and they’d clearly seen my number and put two and two together very swiftly, hahah. The race village itself was quite small, but had a good selection of food and drinks (free) as well as a bar (paid) for anyone who fancied something stronger after their race. 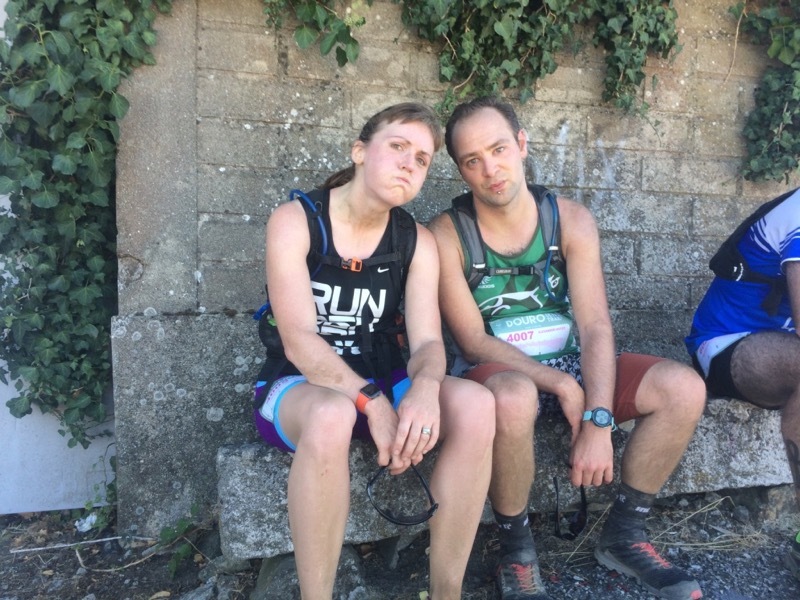 In the tradition of ultras, our race was held on a Saturday, which meant we were able to head back to our hotel to wash the copious dust, sweat, and salt off before heading back to Porto and exploring it the next day. We spent the morning hobbling about, exploring the city, marvelling at the vistas, and drinking or well-earned wine along the same river we’d run to the day before. Having never been to Portugal before, I wasn’t quite sure what to expect, but Alex and I both utterly adored our time there. 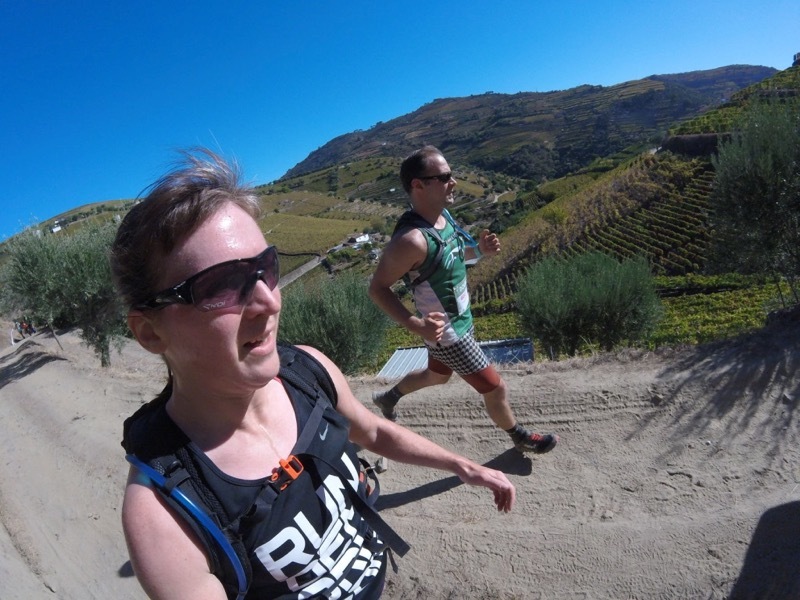 I’d recommend the Douro Ultra Trail to anyone who’s interested, but do not underestimate the toughness of the course. As someone who can run a 1:45 half marathon without too much effort, I expect to run this 25km downhill in about 2-2:15ish but in reality, we finish in just over 3 hours! 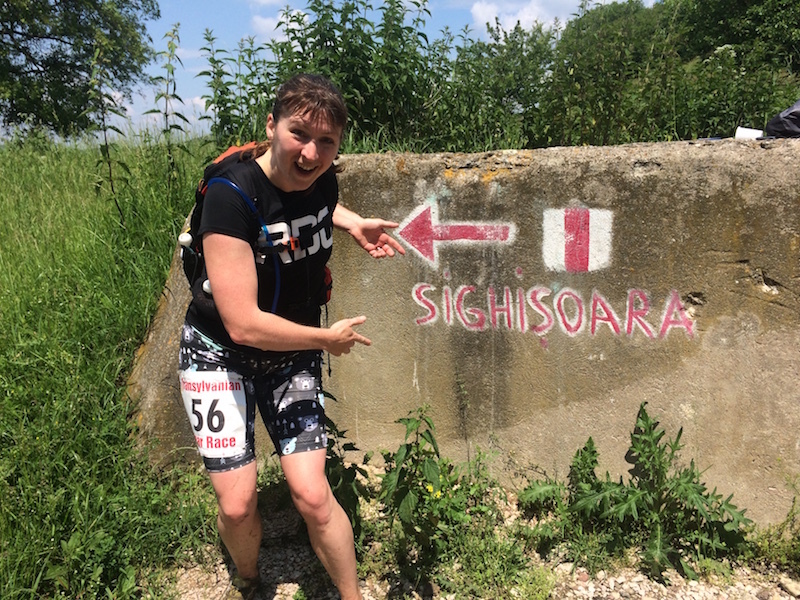 I’d imagine if I’d done the 45km it’d probably have taken me around 5 or 6 hours, so be sure you prepare and (if possible) get some trail experience on hard, rocky ground, which I think would’ve really helped me. 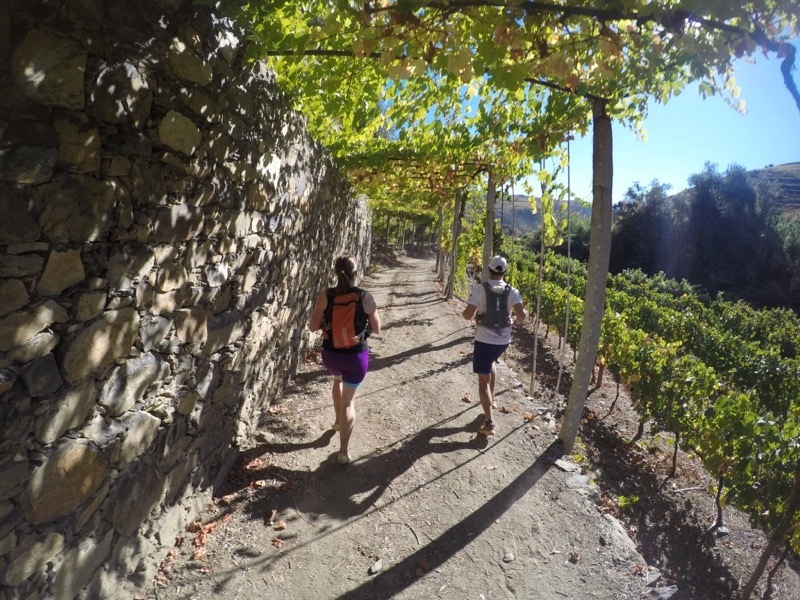 In terms of enjoyment, adventure, and value for money, you really can’t beat the Douro Ultra Trail. I’m only sorry it took me three years to actually take Luis up on his offer! 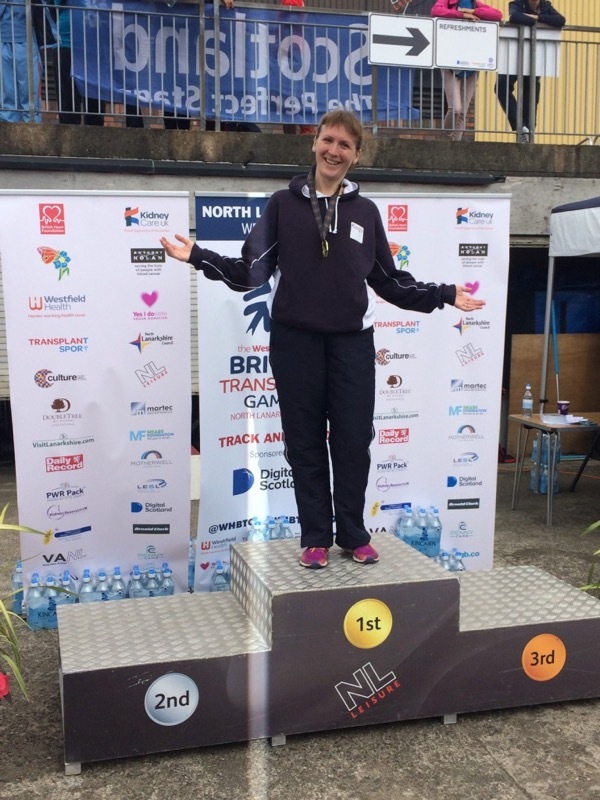 Hot on the heels of the World Transplant Games came this year’s British Transplant Games – yet more running around a track! 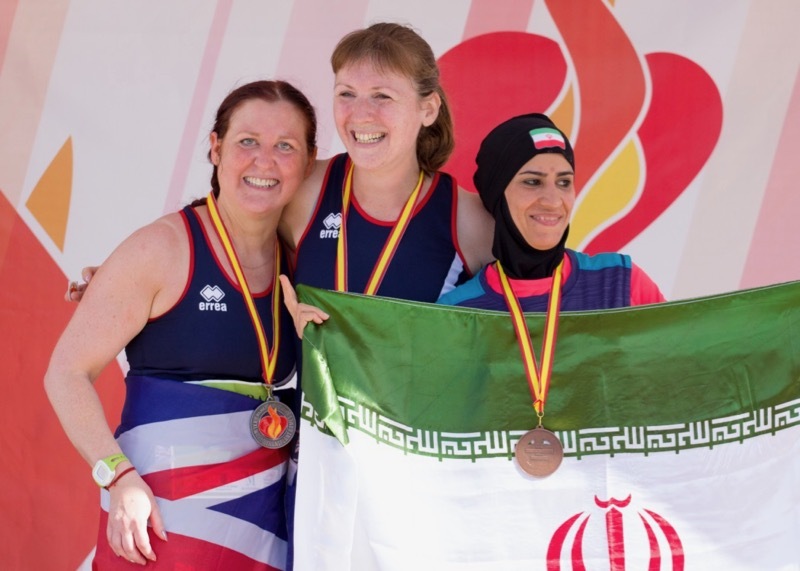 In 2015, the British games came before the Worlds, which made them into a kind of practice-run to check your fitness and make sure that everything’s on track, but having them only a few weeks after the Worlds this time around just made them feel a bit… deflated and overshadowed, which was a shame. 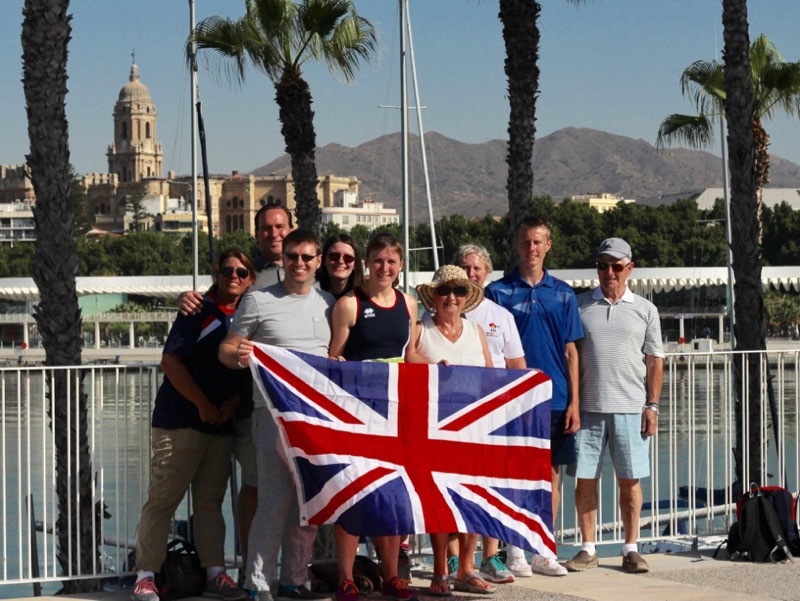 It didn’t help that they were held in North Lanarkshire (“outside Glasgow” to you and me) and were therefore a costly and lengthy journey for quite a lot of people, which meant that a significant proportion of the athletes who’d competed in Malaga weren’t there this year. To be fair, my enthusiasm for these games was at an all-time low, and I’d really only agreed to run after my team manager offered to share her hotel room and drive me around, leaving just the cost of the flight to Glasgow. 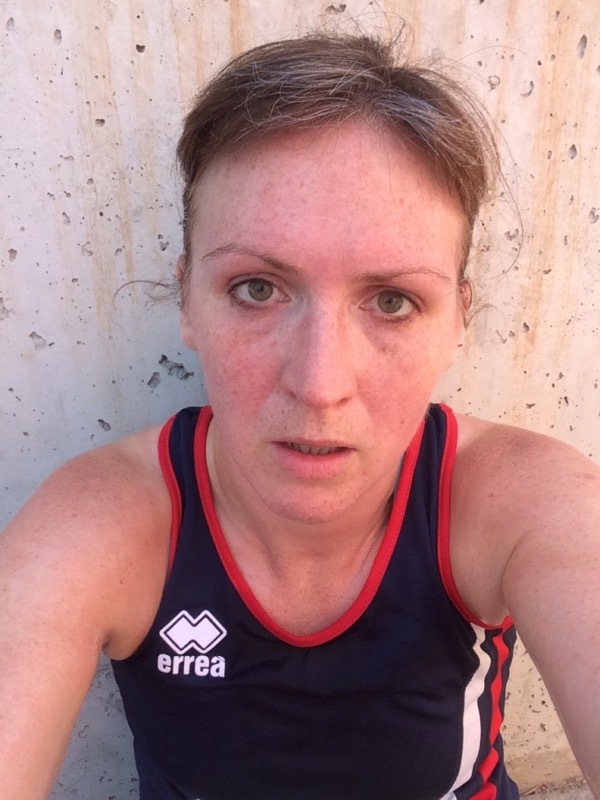 In the weeks between Malaga and North Lanarkshire I’d only managed to run a handful of times (and only one speed session), such is the way of post-competition illness and recovery, but I physically felt like I still had the bulk of my speedwork training in my legs. 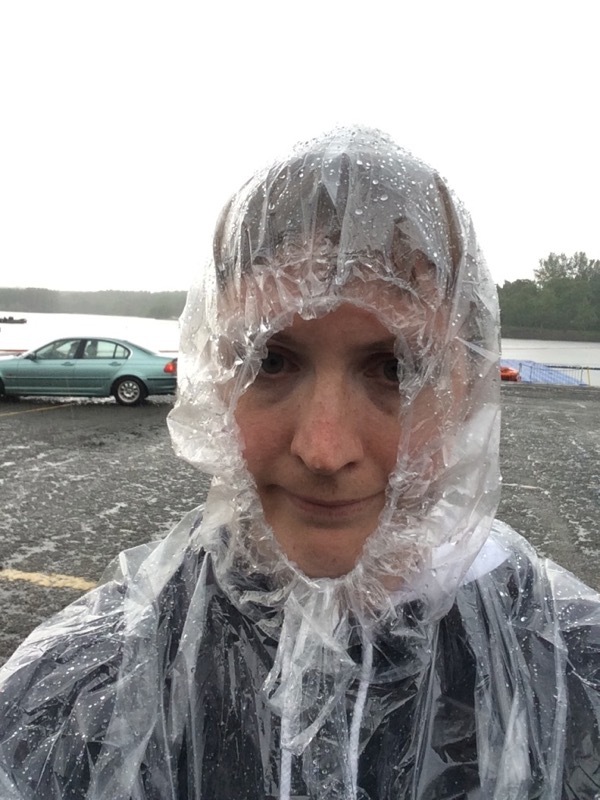 But my motivation and enthusiasm were very low, and the weather for my first event really didn’t help. 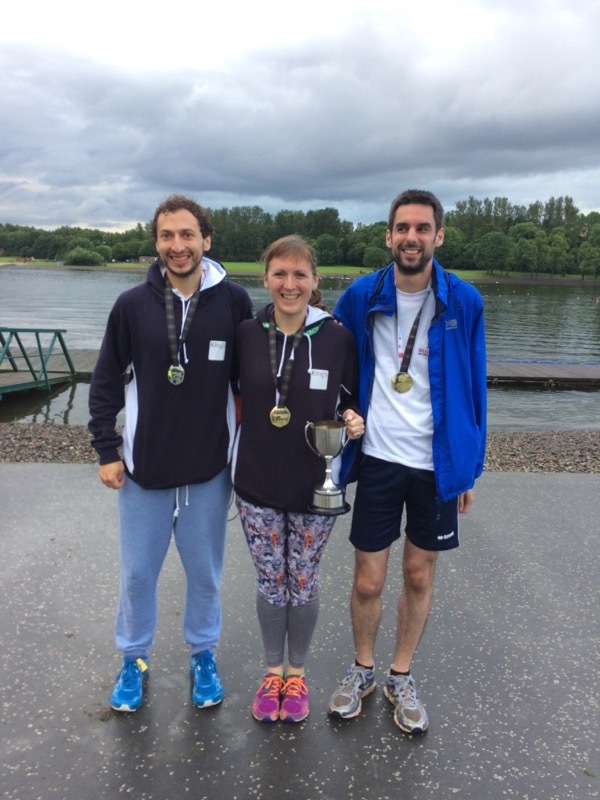 The mini marathon was held in the gorgeous Strathclyde Country Park (location of the Commonwealth Games triathlon), but unfortunately it absolutely chucked it down for a good two hours before the start, meaning we were all soaked, shivvering (I could actually see my breath! ), and huddled together in the few bits of shelter available to us. So pretty much the polar opposite to the oppressive heat in Malaga! 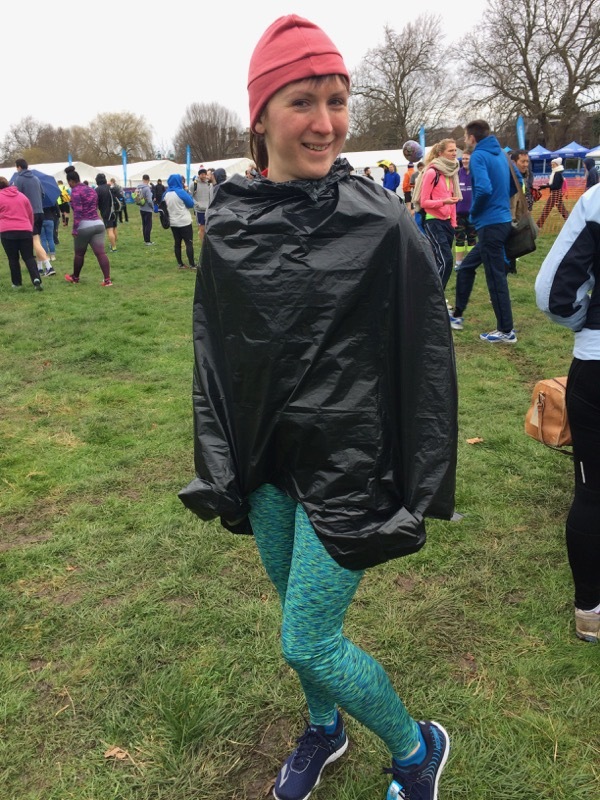 If you’ve ever tried to run in a poncho, I wouldn’t recommend it! You’ve basically got to hold your arms out underneath to keep it from sticking to your legs and ending up around your chest! But it was better than not warming up at all, and after the start was delayed several times, leaving us standing in the starting pen (minus our ponchos) for a further 20min, I was starting to wonder what I was doing there at all, and all the places I’d much rather be. But eventually we set off, and I took the lead for the women’s 3km circuit along the loch. It was surprisingly hilly, but at least our paths were all paved, leaving only some careful footing on the downhills and around areas full of debris left from the previous heavy rain. Said rain held off for the race itself (I guess it decided we were already wet enough ), and apart from having to shout at some marshals who seemed surprised to see me, the race itself went smoothly enough. 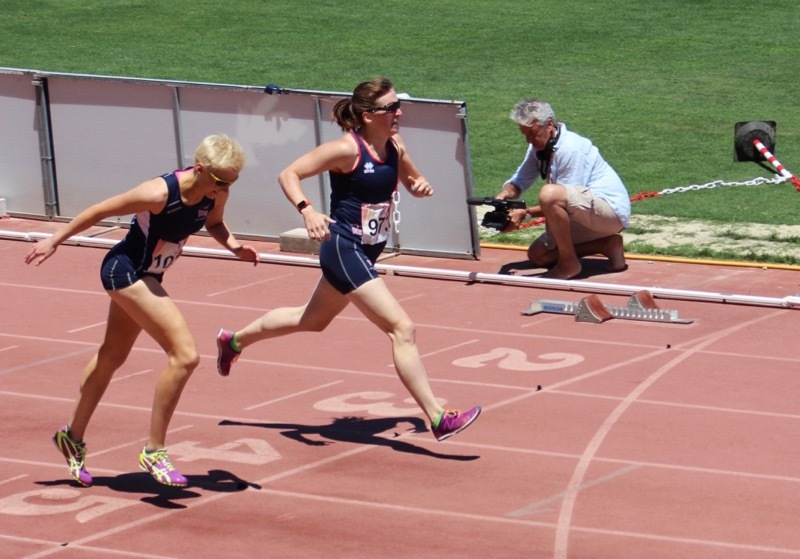 The next day saw us on the track bright and early for the 1500m, traditionally my strongest of the track races. 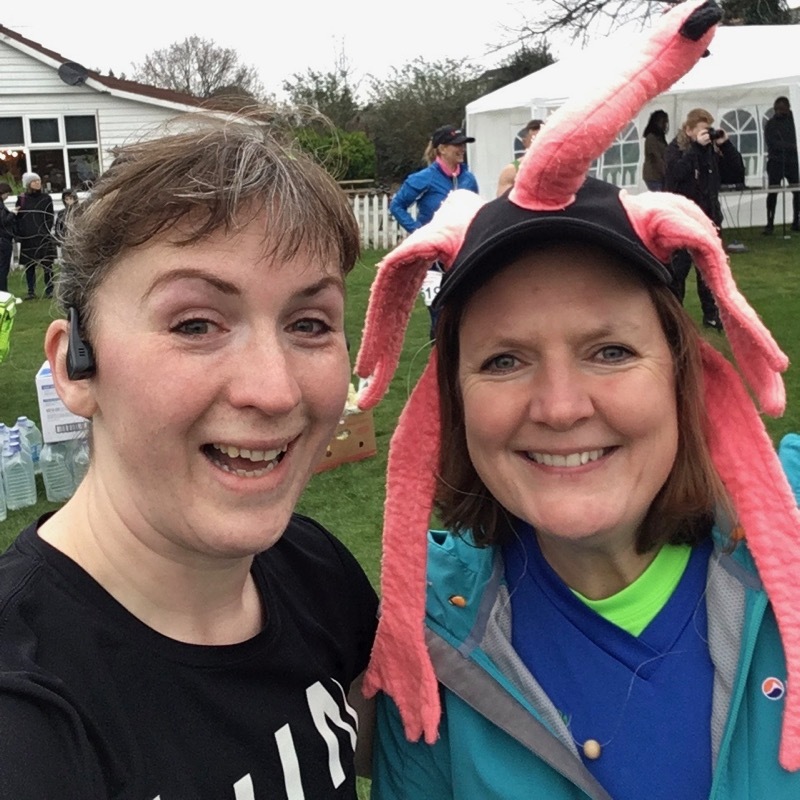 I set off at a fairly aggressive pace, but with my usual competitor, Orla, out of action this year with a stress fracture, I wasn’t quite sure who’d come out to play, so to speak. 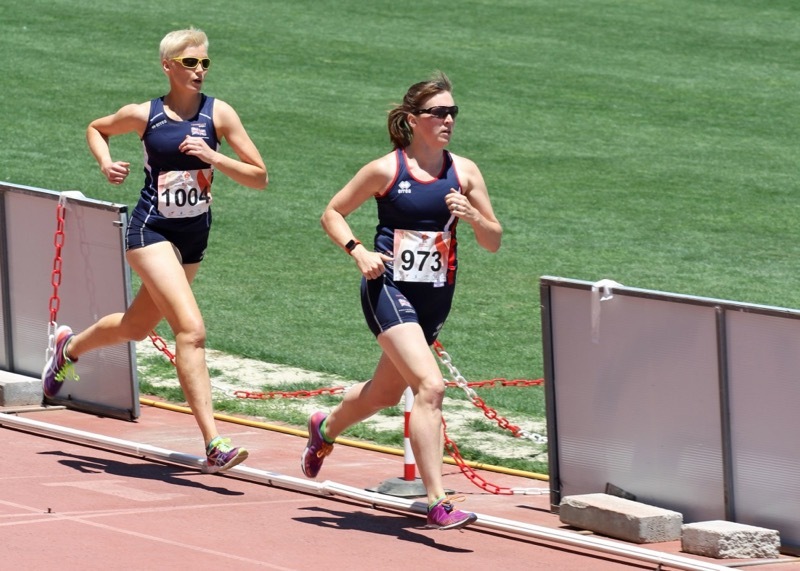 I knew that Nadia and Ellie were behind me again, but I didn’t allow myself a quick peek backwards on the bend until the second lap, when I saw they were together about 200m behind. 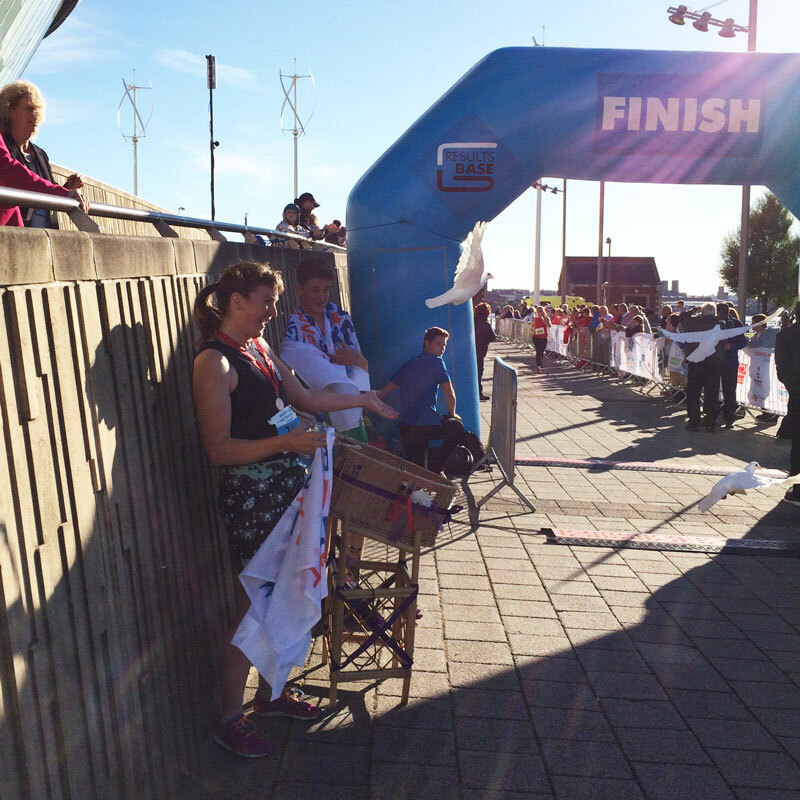 I kept up my pace during the third lap, and then, as I rounded into the 4th and final lap, I waited to hear the next bell, which felt quite far behind, enough to give myself a bit of a breather coming into the finish. I hadn’t quite gained my breath when I was able to see Ellie sneak past Nadia right near the end to flip their positions from the night before, with my friend Ruth finishing in 4th. 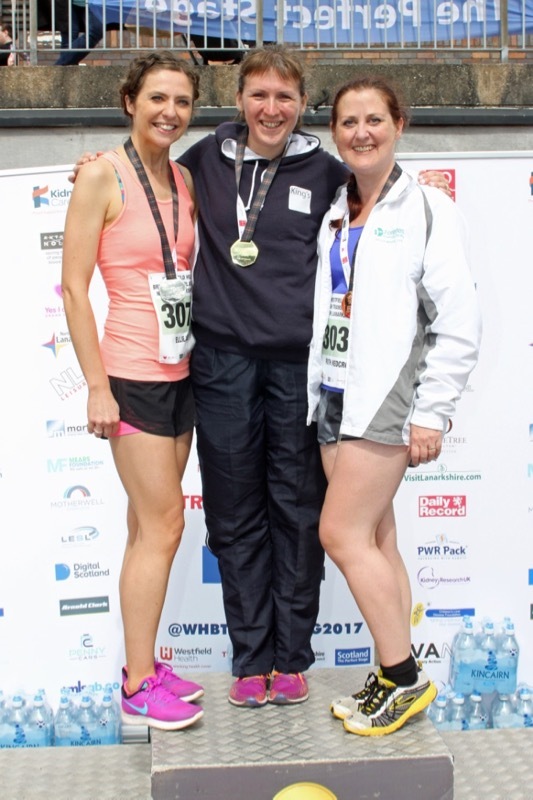 I might add that all of us are in our 30s, too – clearly the toughest age group for female transplant athletes!! I then had quite a few hours to rest, eat, and cheer on my Kings College Hospital teammates (what little there were this year!) before the 200m after lunchtime. 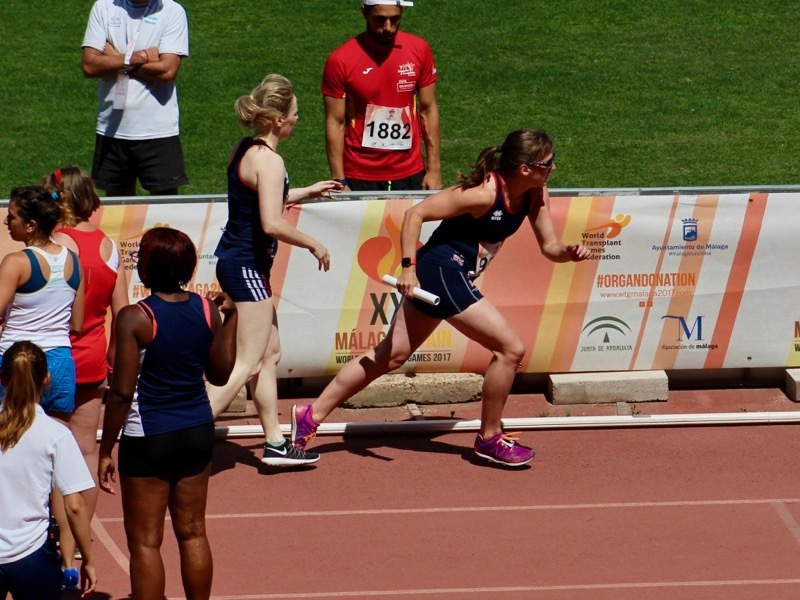 The 200m is traditionally my weakest event, but with so many of the Team GB athletes either absent or injured, it turned out that I was the only one in my age category on the start line. Score! An opportunity to just jog it in, right? 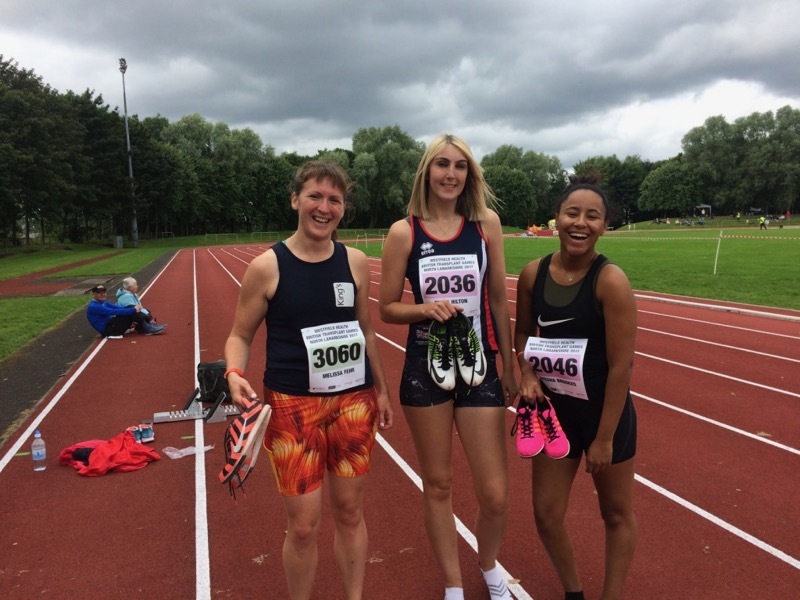 Not really – in my same heat were the 20 year olds (Emma and Ayesha, pictured above) but also, strangely, the 12-14 year olds! This was definitely a first, competing against children! 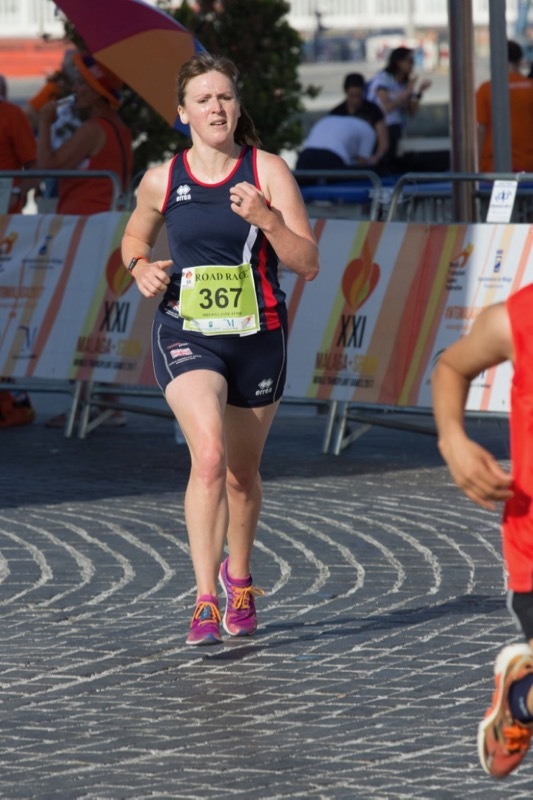 And my pride dictated that I couldn’t be beaten by children, and I knew one of the Kings girls was really quick, so I actually had to push myself, finishing second overall in a time less than a second over my PB in Malaga (and yes, I beat all the children). So I enjoyed a very rare lone podium moment to do my best model poses! 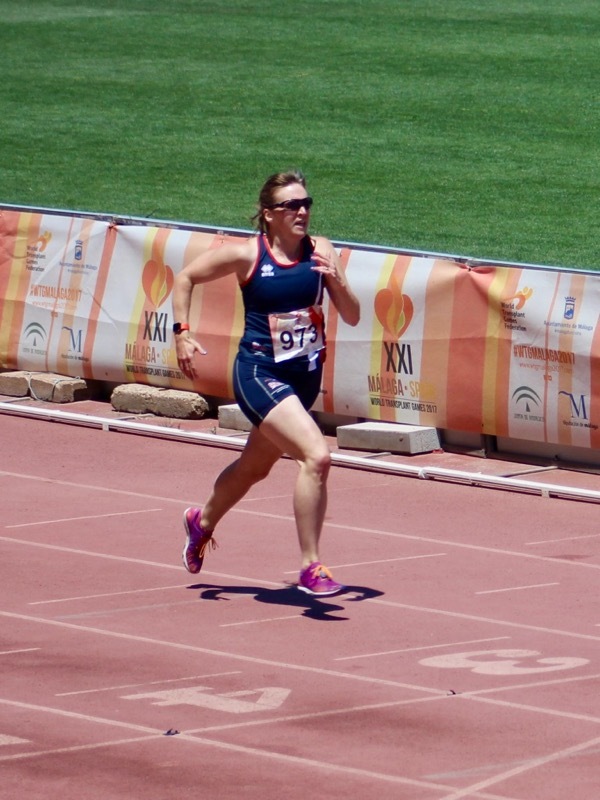 I then had about a half hour break before the 400m, but I’d clearly given my legs more of a bashing than I’d realised in the 200m, because as I rounded the final curve into the finishing straight, my legs just… died. I mean, it felt like I was swimming in treacle and everything was in slow-motion, disconnected and just awful. I’ve never ever felt this way in any run before of any distance, and to be honest, I’m not even sure what the cause was. But apparently Ellie oddly had the same phenomenon – the way she put it, she hit a wall at that final straight as well, but was perplexed as to why I wasn’t getting any further away from her! 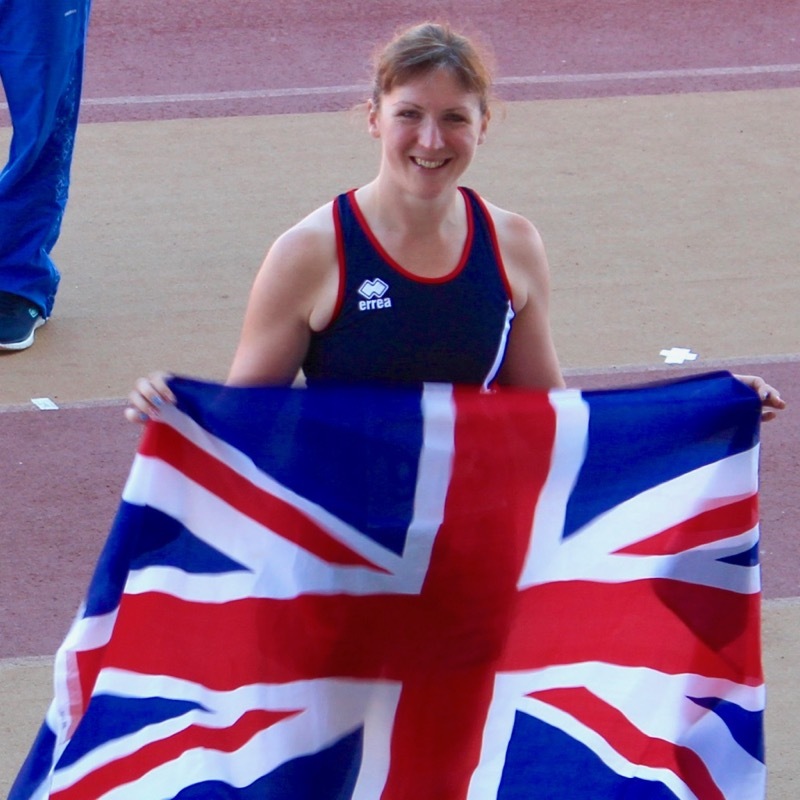 Note: it’s literally only now, two weeks later, as I’m writing up this review that I noticed I actually ran a PB in the 400m! 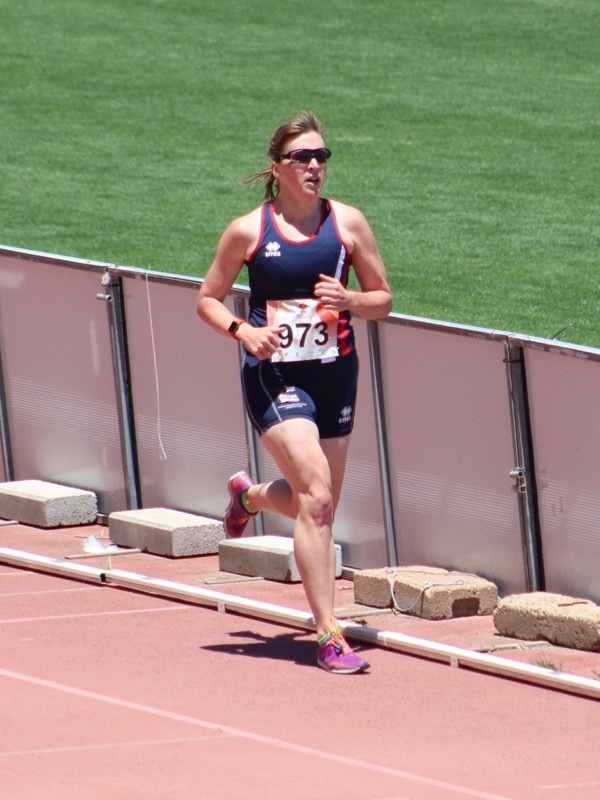 This might be some explanation as to why I felt so bad, as it’s likely my legs started out at 200m pace! 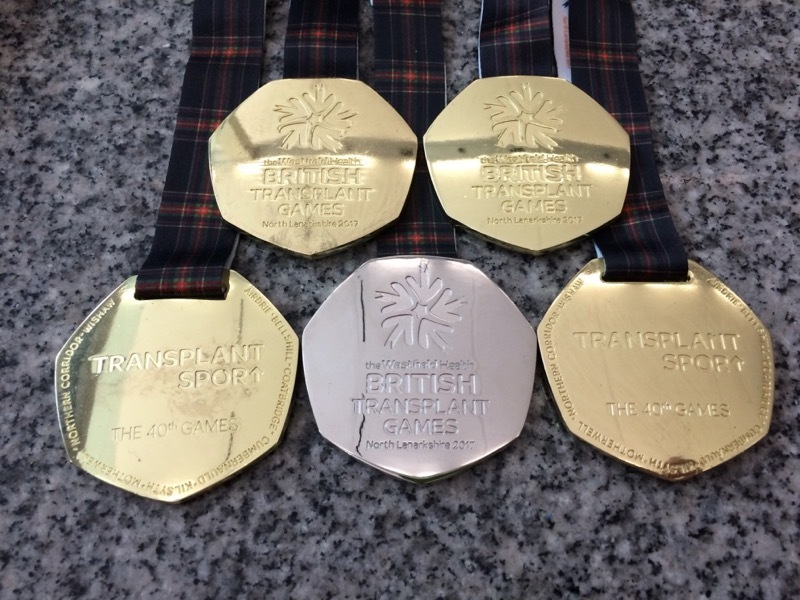 Just a brief aside at this point to say that this was not only Ellie’s first year at the British Transplant Games, but she had only had her liver transplant 6 months before!! 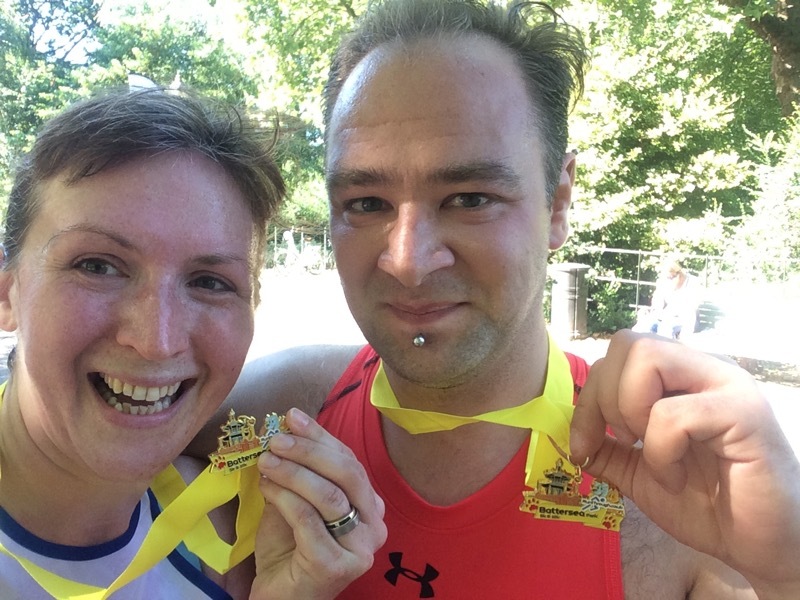 She and her husband are race directors for the Running the Rift marathon in Uganda, and you can read more about her transplant story here (and you should!). At this point in the Games I’d normally be pleading with our team captain to please not make me run the mixed 100m relay, but the eclectic scheduling this year (with the 800m being run after the relay, which is traditionally the last event) plus the fact that the only runners on our team this year were all distance runners (and all of us running the 800m), meant that I didn’t even have to plead – no relay for Team Kings, hurrah! But I was already absolutely shattered, and really I just wanted to get the 800m over and done with and get to the airport to fly home. 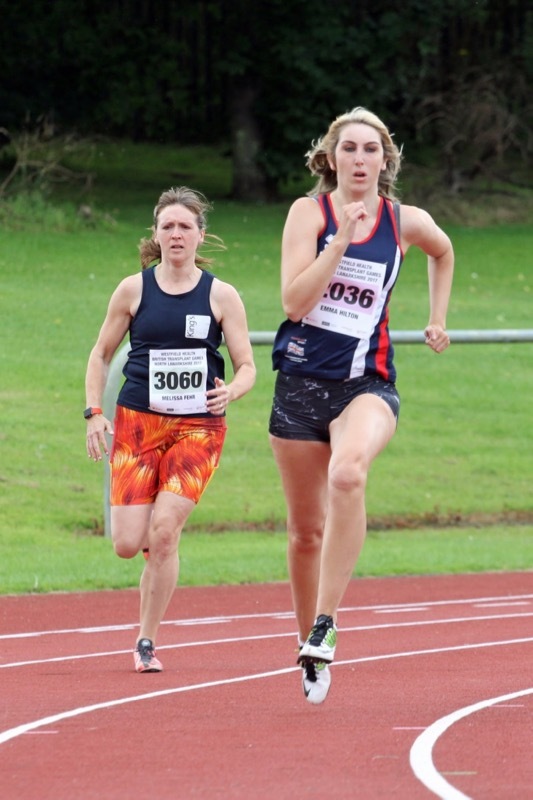 So when the gun eventually went off, I led a pretty sedate pace around the track – even a bit slower than my 1500m pace, purely because I knew I was knackered and the horrible finishing straight of the 400m was fresh in my mind. Nadia had already headed home by this point so it was just Ellie behind me, and I could hear she was close behind me in Lane 1. 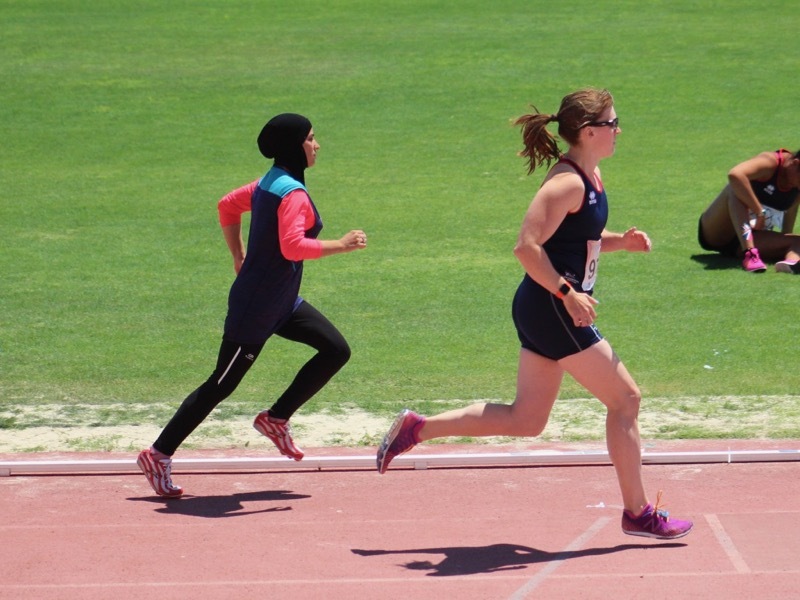 She stuck on my tail until the last 200m or so, and I really only saw her make her move in the last 100m, when it was too late to really answer (as if my legs had anything left to give!). 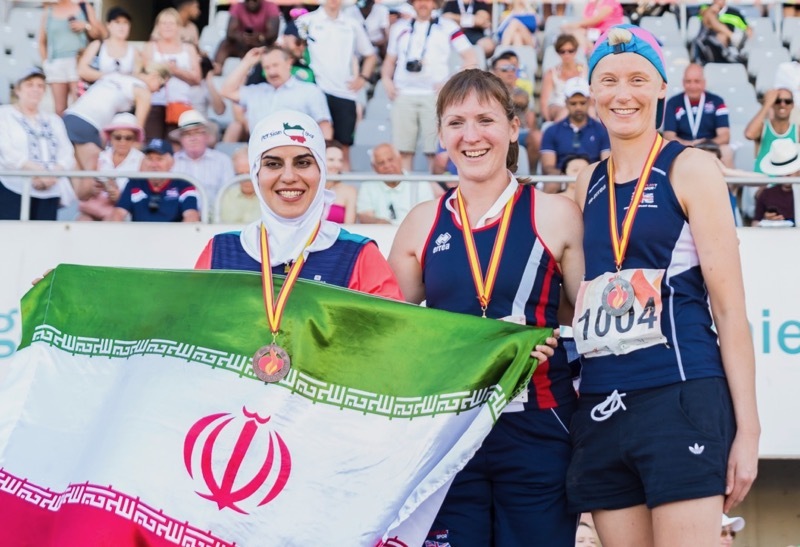 Even though I got silver, I crossed the line with the biggest smile of the day – it felt right that such a strong athlete should get to go home with a gold, and she had certainly earned that! 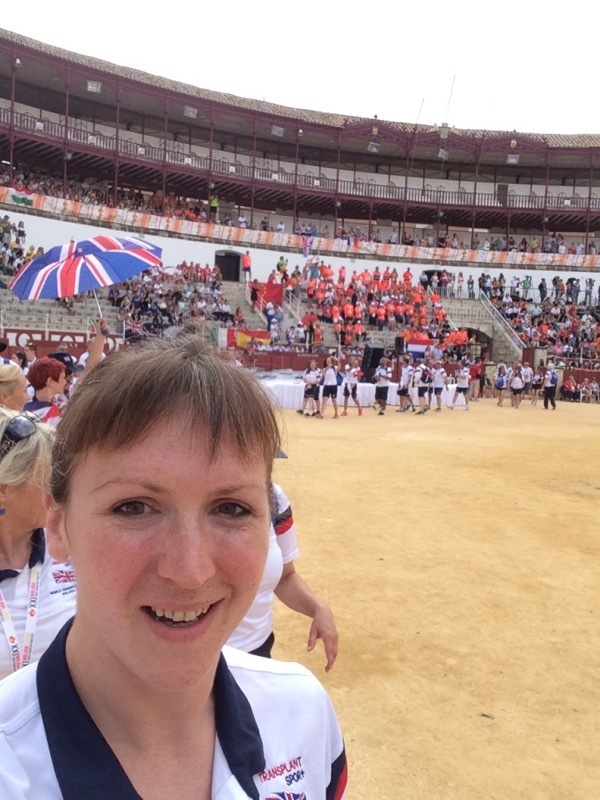 The final event of the Games actually came as I was boarding my (rather delayed) flight back to London, when my team captain texted me to say that I’d just been jointly awarded Best Senior Female with another athlete! Even though I’ve won lots of medals in my last five years competing at the Games, I’ve never ever come close to the best age group award (across all the sports), and I was chuffed to bits to hear I’d been given this honour! 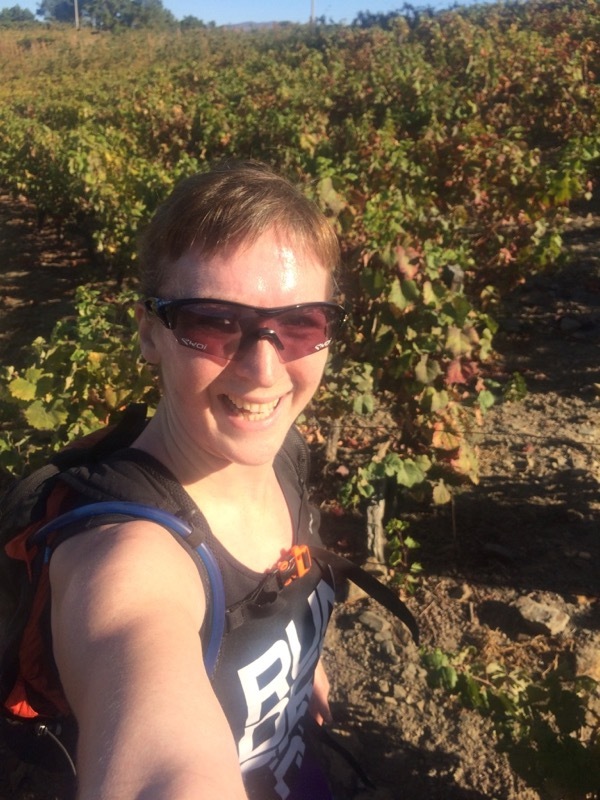 And now, with my track running out of the way, I’m so pleased I can finally head back to some long and hilly trail runs in preparation for a hilly 25km race in Portugal in October – much closer to the running I love the most right now! 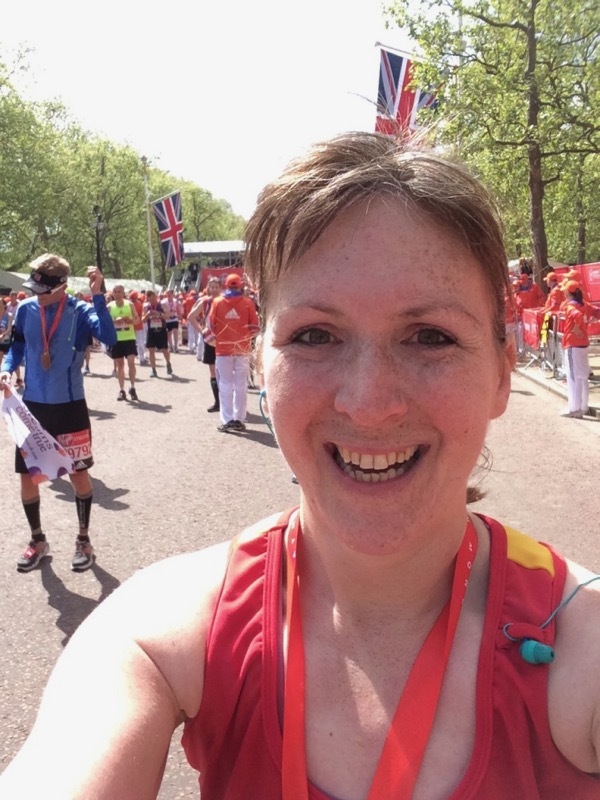 Having been seriously ill for the first third of last year, I had to defer my London Marathon place to this year. Beyond giving me a sense of humility, perspective, and appreciation for my health, it also gave me the renewed vigour in my training to not take this opportunity for granted. It took pretty much all of 2016 for my body to recover (both from the illness and my first ultra on an accelerated training schedule) and my training since January has also been a bit more experimental than usual. On my request, I’ve been doing a lot more low carb, fat-adapted cardio training, plus my coach Barbara has been working a lot with me on muscle activation and running form. Cue lots of targeted strength training (hello Monday night 500x park bench stepups! ), and my longest runs were only barely 3hrs this time around. But I felt like my previous years’ marathon pace of 5min/km (8min/mi) was still a good bet, so I set off with the mindset to try and “tickle my PB” of 3:30 by keeping a relaxed and controlled first half. A 20min wait for a bus followed by a further 10min wait for a train (then the 15min walk from Maze Hill to the Green Start!) left me entering the start zone just as the last calls for the baggage trucks were being announced. 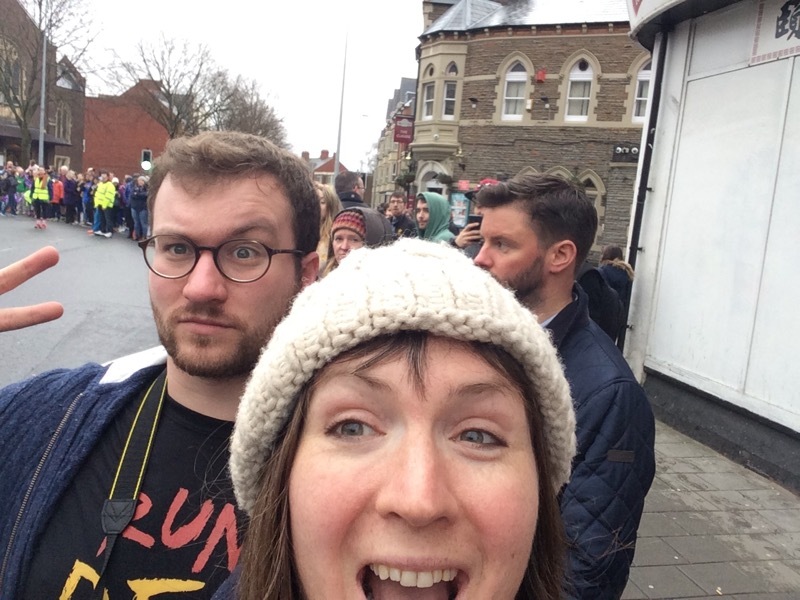 From there I joined one of the enormous toilet queues, finally getting to the front at 9:58! It meant I didn’t get to meet up with my friend Steph (we had a loose plan to run together since we were going for the same time and in the same pen), and I don’t even know where my start pen was meant to be, but I crossed the line at 10:02 determined to not let it stress me. 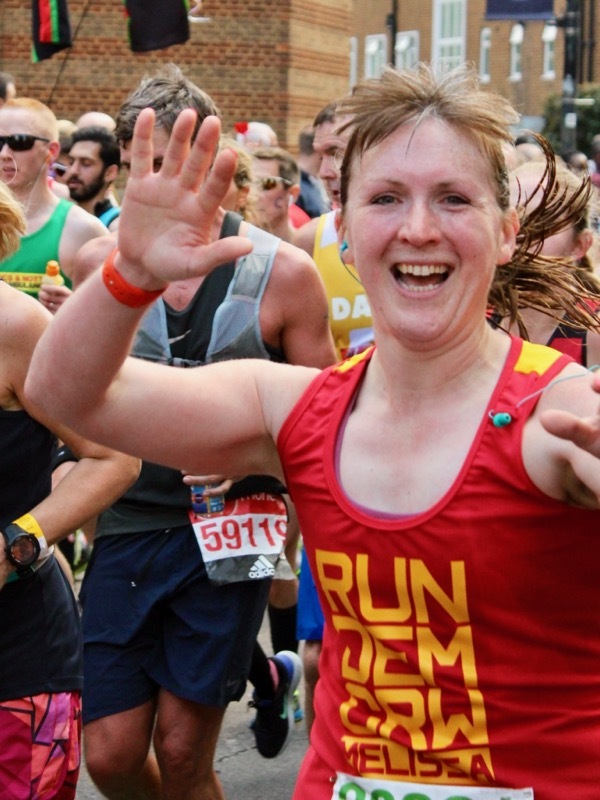 I opted for my usual road marathon choice of one headphone only with my carefully curated marathon playlist – easy, chilled songs at the start, getting gradually more intense throughout the race when I need the boost. Having one ear free means I can hear the crowd shout my name, or equally, try to tune out the screaming and focus on my music instead when I need to. This was my first big race using my AppleWatch (running the brilliant Runmeter app) as my GPS/pace watch, and I freaking loved it. I set up a custom screen on Runmeter that just shows me my elapsed time and current pace in a large font, so I did a lot of checking my pace in the first half and adjusting my legs faster or slower as needed to stay on that 5:00 target. I was toying with turning off the heart rate monitoring during the race to save battery, but in the end I kept it on more for the record of it than anything else, and it seemed to stay in the mid-170s throughout (Zone 3 for me). The AppleWatch battery itself is brilliant, but I will say that being connected to the phone through bluetooth for extended periods of time absolutely kills my phone’s (5S) battery, so I needed to run with that in a battery case. But considering I threw my Garmin in the bin after near-continuous “Finding satellite” failures plus a typeface I could barely read at a glance, I am all aboard the AppleWatch-for-running train! For some people, running with a phone, battery, multiple gels, headphones, and salt caps might be an issue, but hey, that’s why I design activewear! 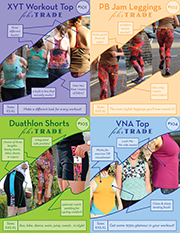 With my “sew your own activewear” book deadline being the day after the marathon, my publishers asked if I could run it in designs from the book to help with marketing down the line. 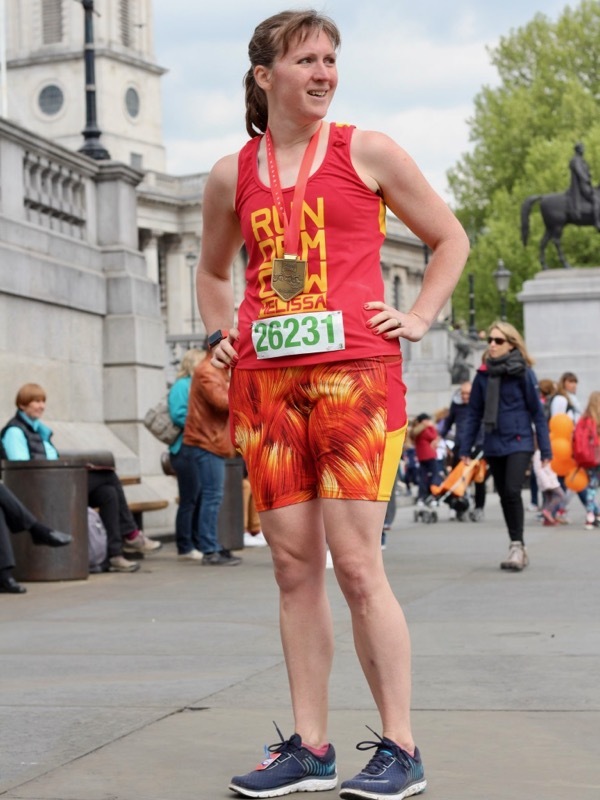 I’ve run all 6 of my previous marathons in me-made gear, but I usually wear a Run dem Crew shirt or vest on top. This time I wanted to both rep my crew AND show off my book designs, so I made my shorts and vest from modified designs which will appear in my book (coming out early 2018), and took the vest up to Big Teezar in Camden to get the RDC logo and my name vinyl printed onto the front. The shorts are actually a leggings design from my book chopped off above the knee (which unfortunately cuts out a lot of the design interest!) with an additional back waistband pocket bringing the pocket total up to FIVE. FIVE BIG POCKETS, PEOPLE. My vest takes the offset side seams of one design in the book, but uses the neckline and armholes of a different vest design from the book, and I tweaked the ease to be somewhere between close- and loose-fitting. I know what I like for racing, and I wanted it to be perfect! The colour scheme started with the flame-print lycra I got printed at FunkiFabrics, using rust supplex, red supplex, and yellow chitosante down the side pockets, and reusing the red and yellow in the vest top. I was trying not to see it as McDonalds (or Serpentine! ), but a friend said I was channelling Baywatch and Hulk Hogan, so I’m going to go with that!! But back to the race – in a marathon my goal is to reach the first half as controlled and relaxed as possible, having spent minimal energy. So I settled into my marathon pace, kept things relaxed, and kept an eye out for my husband at Mile 12 in our old neighbourhood. Seeing Princes Harry, William, and Kate cheering at maritime Greenwich was more than a little surreal, and running into my 2014 #ExtraMile buddy Ibi on the course at Mile 3 was kinda crazy, but for the most part south London was just a chillaxed blur. One thing I love about the London course is that, if you run around a 3:30 pace, you get to see the Elites coming down The Highway around their KM35 as you’re going up the opposite side of the road approaching the halfway point. This means I got to see Wanjiru, Bekele and the others in full form from only a few metres away, but also cheer on my amaaaaaazing friend Tom Payn repping his RDC vest on his way to a 2:22 finish! I crossed halfway bang on schedule at 1:46, and it was shortly after this that my first muscle issue began to appear – a curious pain on the top of my left ankle. It got bad enough that at one point I actually stopped to loosen my shoelace, but I’m still not sure what the issue was, as I’ve never had a pain there before in my life (and post-race it was definitely red and angry). 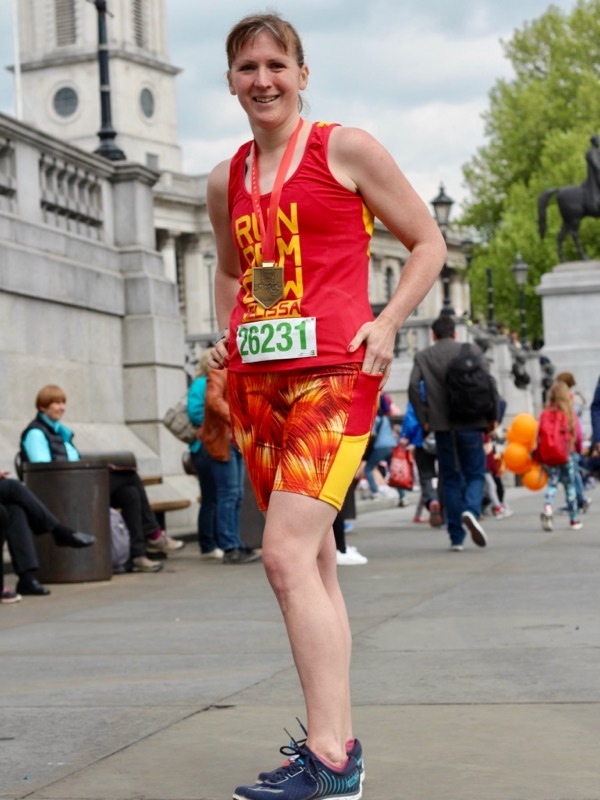 But soon I had bigger issues to worry about, as I began to get some very tight cramps/knots in both quads at the same place – inner thigh a few inches above the knee – again, a strange place and a first for me in any run. This tightness started around the Isle of Dogs and slowed my pace by a few seconds per km. I stopped to stretch out my quads at one point to try and shift it, as well as a quick thumb-massage, but to no avail. 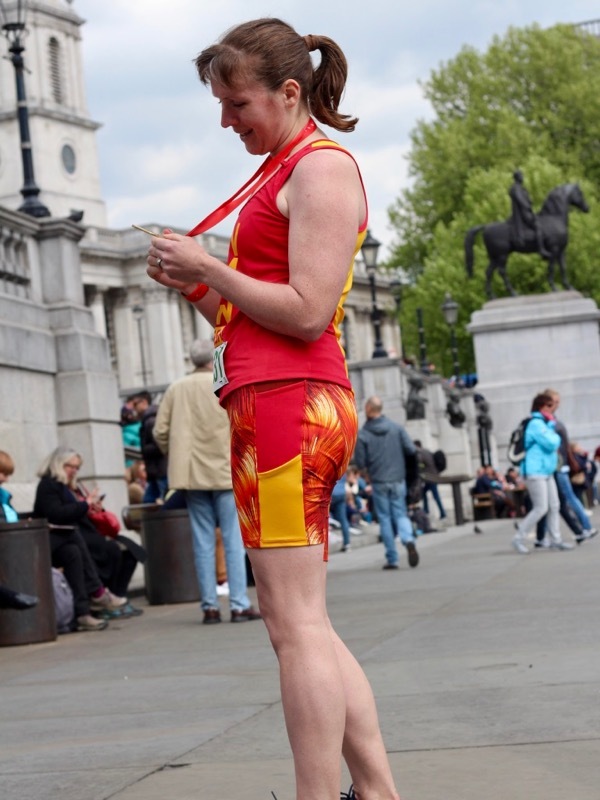 It gradually got worse, and by Canary Wharf and Poplar it felt like I had a fist-sized rock in each thigh, making every step painful and making maintaining pace difficult. 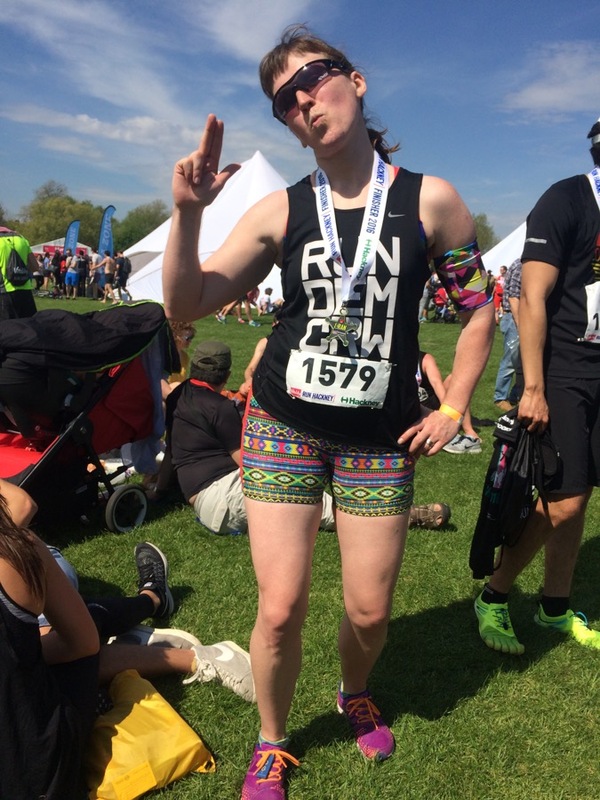 I kept telling myself “Just make it to Mile 21 [where the RDC cheer station is] and maybe Barbara [my coach] can massage it out…” Mile 21 is incredibly motivating at the best of times, but when you’re suffering, the boost it gives is immeasurable. Hell, even just knowing that it’s coming up will push you to carry on, and when I arrived to a million familiar smiles, high fives, confetti cannon, and hugs, it was just the boost I needed. I found out that Barbara wasn’t there, though (having had to cover a class that day) so I resigned myself to a painful last five miles. The pain in my legs and ankle got worse, plus somewhere along the Embankment the back of my knee started to pop, leading me to try to stretch out my quads again after my leg nearly gave out entirely a few times (apologies to the spectators who got to hear a string of continuous F-bombs…), and finally I just realised that I needed to put my head down and push through whatever else was coming, even if it meant falling flat on my face. So I sucked it up, willed myself forward, and remembered that I was privileged not only to be alive, but to be running again. 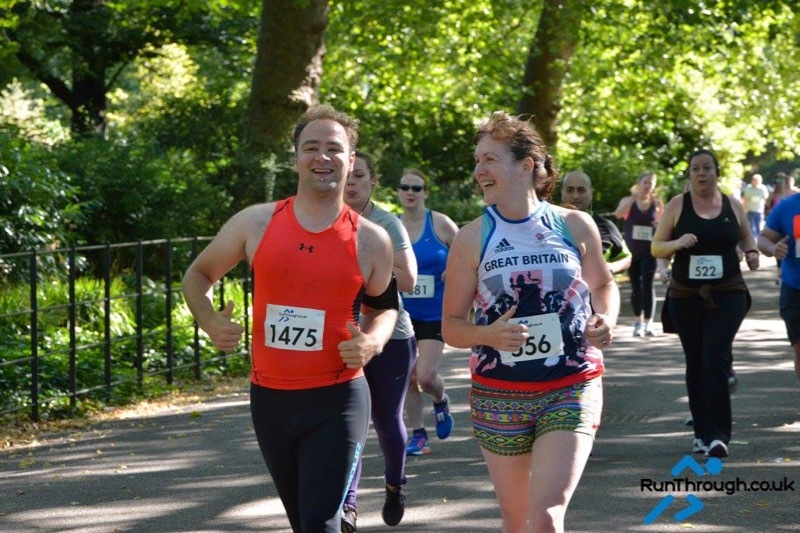 And despite all the above, I managed to pick up the pace in the last mile for a final finish time of 3:38:58 – not quite tickling my PB as I’d hoped, but still a GFA (guaranteed entry for next year) and a Boston Qualifier, so ultimately worth the pain. Pre-race massages are NOT optional. A yoga session the day before helped, but I know that tightness in my hamstrings and hip flexors was likely the cause of my quad distress. I was lax on my massages this year, and I need to do better in future. I need to increase my Magnesium levels during marathon training. I’ve known for years that I’m a “salty sweater” and a routine blood test a few weeks before the race revealed my Magnesium levels were low, but I found out too late to do much about it. I took two salt caps during the race, but it’s no replacement for regular stores and likely caused the cramping issues. But it wasn’t all bad, and I really do take on board lessons I’ve learned in previous marathons, too. 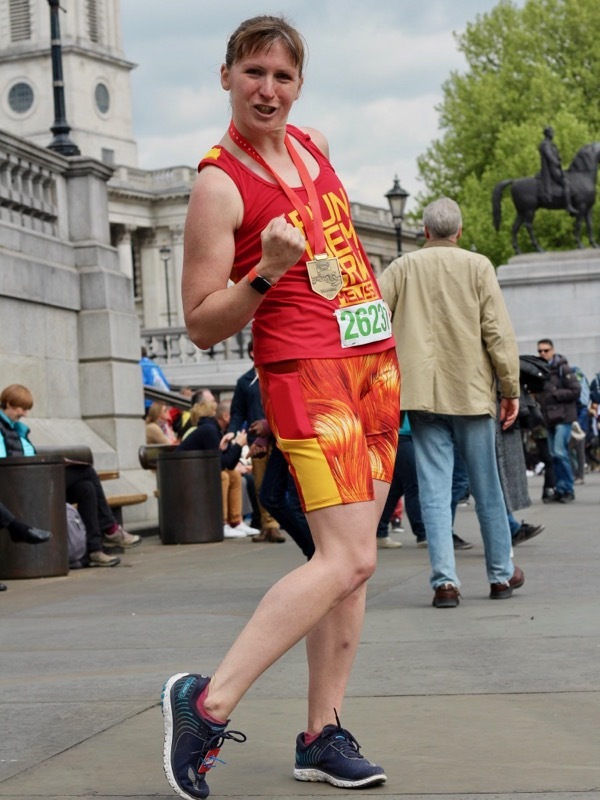 I’m particularly proud of my rock-solid pacing this year, holding back and staying strictly on target marathon pace, especially in the first 10k when it’s tempting to go faster because you feel fine and easy (learnt in London marathon 2014). I was also absolutely on-point with my nutrition, taking either a gel or two ShotBloks every 5km up to 35 (I brought one for 40km, but I hardly ever take it, and this year was no different) even when I was zero desire to shove another down my face and I don’t feel like I need it and salt caps at halfway and again at Canary Wharf (30km). I also did a great job at staying relaxed in the first half, sticking to my aim of using as little energy as possible to reach halfway. In past years I get overexcited, weave around people too much, and high five too many kids (sorry kids, but that takes energy! ), and it really comes back to bite me later in the race. 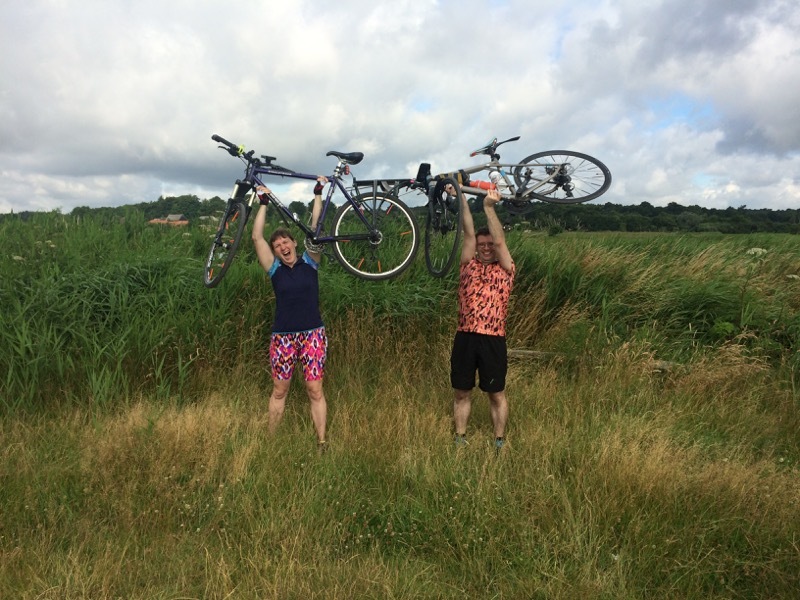 And finally, in the latter stages, I walked through the water stations (learnt in Berlin 2014), and stopped to stretch out my legs when something was tight (it didn’t actually fix it this time, but I learnt in Copenhagen 2013 that a few shorts stops and walking breaks only adds a negligible amount of time). Marathons are an interesting challenge. 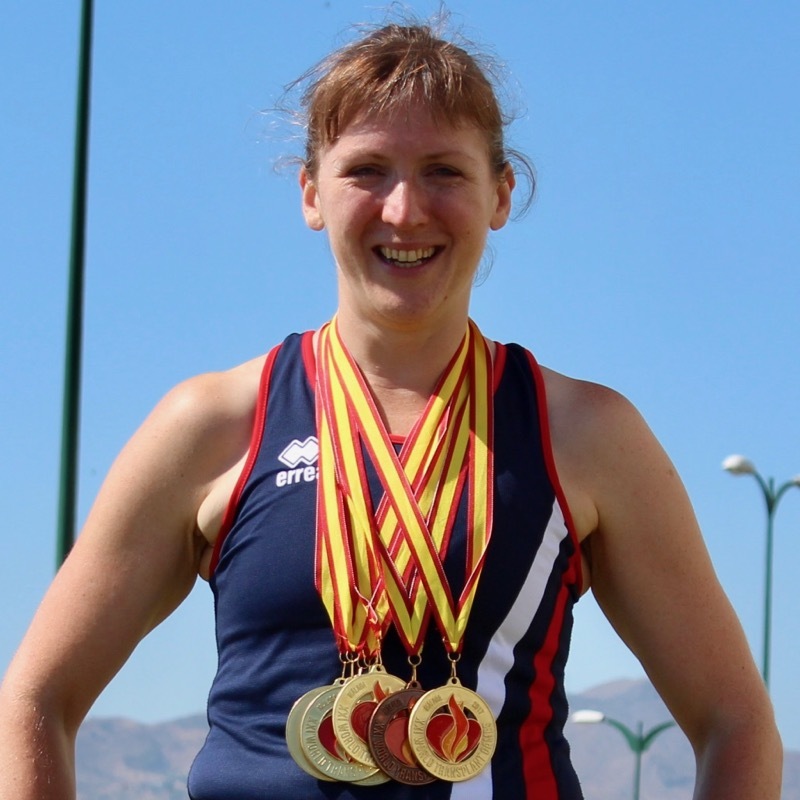 You can do everything right in training, have perfect weather (albeit a bit too sunny for my liking), the right mindset, but still have things go wrong. You just have to learn from them, come back stronger, and try again next time. 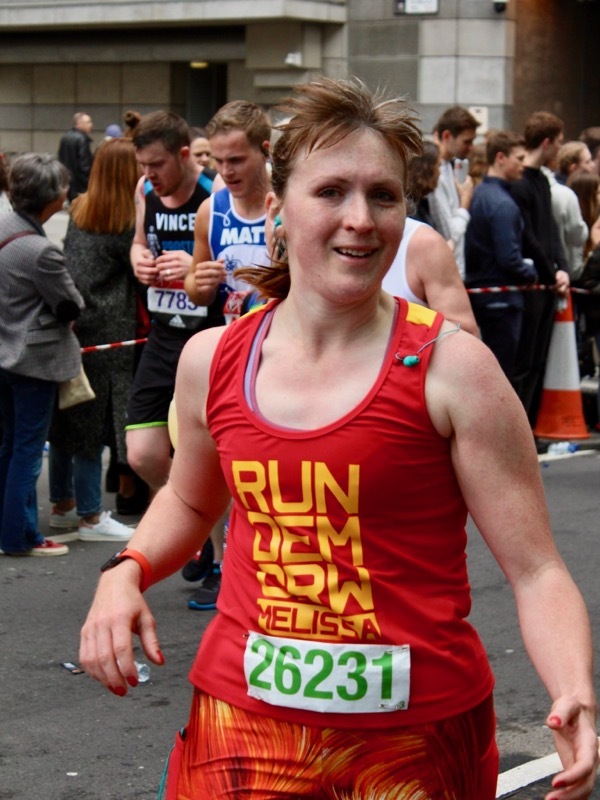 I think it’s part of the reason why I keep coming back to the marathon distance – I know I have a sub-3:30 in me – I just have to get all the little pieces in place (plus have some luck with the weather) and have the right day. But there’s no rush – I know my day will come. I didn’t mean to run this race. When Events to Live made an announcement a month or so ago that, after ten years of putting on races, this race would be their last, I was really quite sad. ETL are one of the very few events companies that I would go and enter races from specifically because they were putting them on. 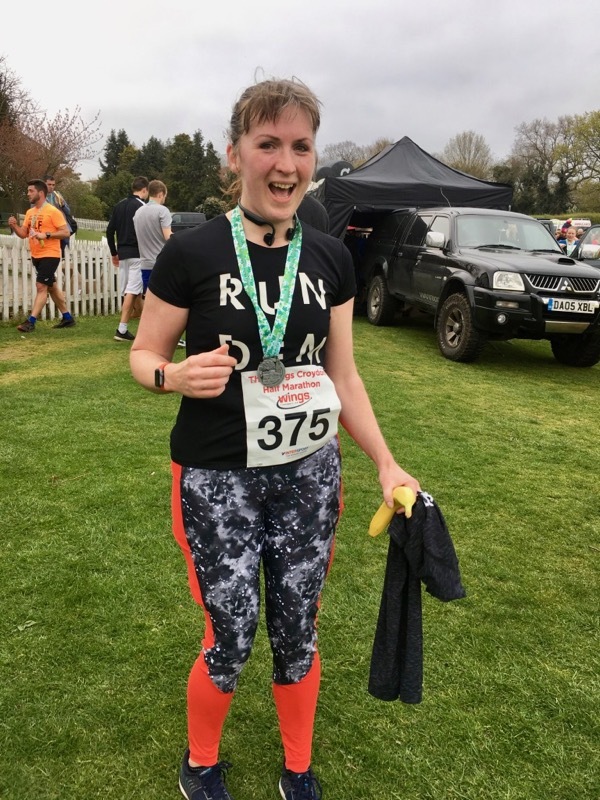 They always chose fantastic, interesting routes around the Surrey Hills, yes, but you could just tell that the organisers cared deeply about the people running it and there was always a family feel to each one. 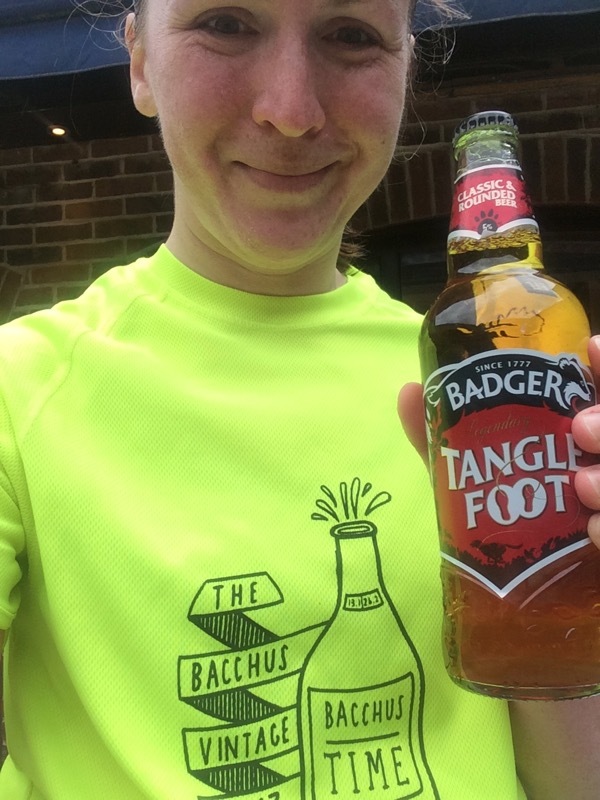 Their best known race is undoubtedly Bacchus (which I’ve run twice and will carry on, organised by Denbies Winery in the future), but their smaller races have been just as enjoyable for me, and I know that I will have a fabulously good time whenever I sign up to an ETL race. I just thought I’d have years to try them all! 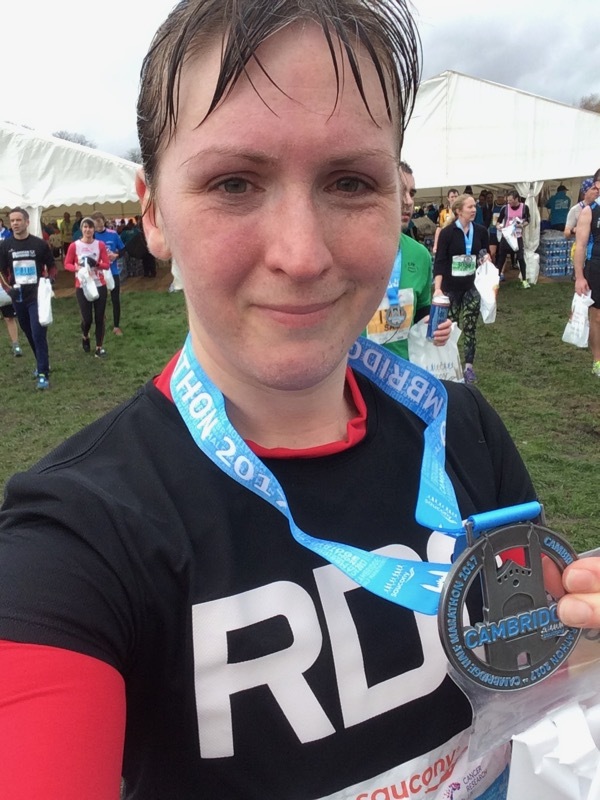 When they announced that Surrey Badger half would be their last, I didn’t think I’d be able to run it, as it was only a few weeks after Cambridge Half and the day after a big Team GB training session in Coventry, where I’d be running a hard track session. But as it turned out, I just ended up doing some easy miles on the track with my teammate Ruth instead (another trail runner and Bacchus alumni), and after I got home that evening I was still feeling good, but unsure about where I fancied heading for my planned “two hour trail, HR zone 2” run in the morning. 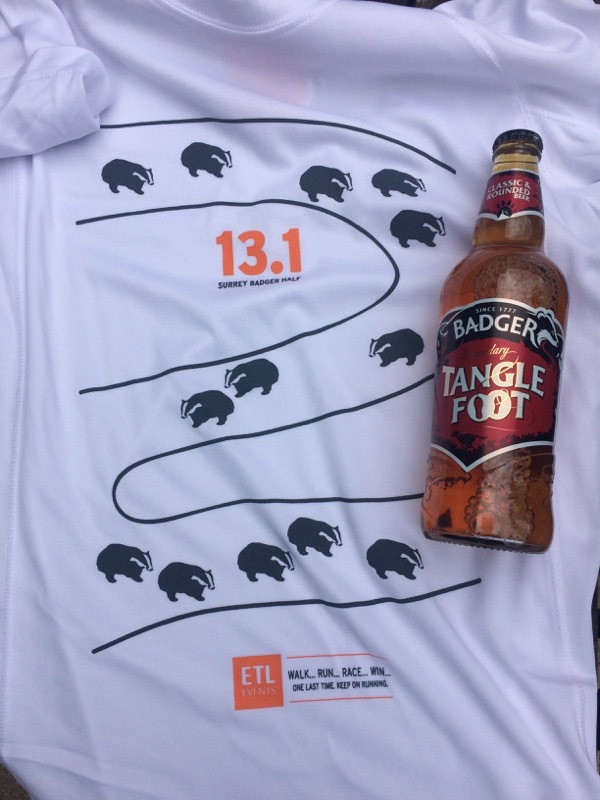 And then I saw ETL tweet that on-the-day entries would be available for the Badger. And miraculously, engineering works had spared the Waterloo-Dorking line so I could get down there for the start. It seemed like the Universe was pointing towards me moving my planned trail run to the Surrey Hills instead, and so I got up early and hopped on a train for the second day in a row. Usually I race in a Run dem Crew tee to pay back my crew for everything they’ve done for me, my health, and my running, but this time around I wanted to run as a celebration for everything ETL had done for the running community and my growing love of long trail runs (if it wasn’t for their runs, I doubt I would’ve signed up for Transylvania, for instance!). 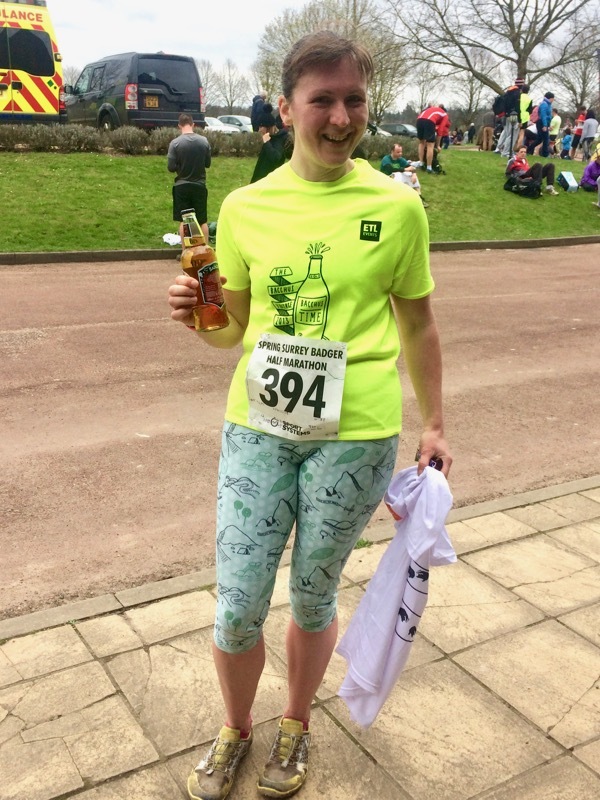 So instead I wore my Bacchus 2013 tee, paired with my Steeplechase capris made in fabric designed by Laurie King, who designs all the medals and shirts for the ETL races and is well known in the area (prompting lots of compliments from other runners!). Myself and Laurie King, who designed both my capri fabric and my Bacchus race tee! I’d never run this particular course before, but, having studied the route on the train ride down, it appeared to be fairly similar to the 2nd lap of their Three Molehills race, which I’d run a few years back in biblical weather. The Badger takes a nice loop around the vineyards to thin out the field, then a few straight miles on a tarmac path along the motorway – easily the most boring part of the race, but it meant I was able to get some decent speed in and also meet a nice chap named David, who was running it for the third time and hoping to break 2 hours. 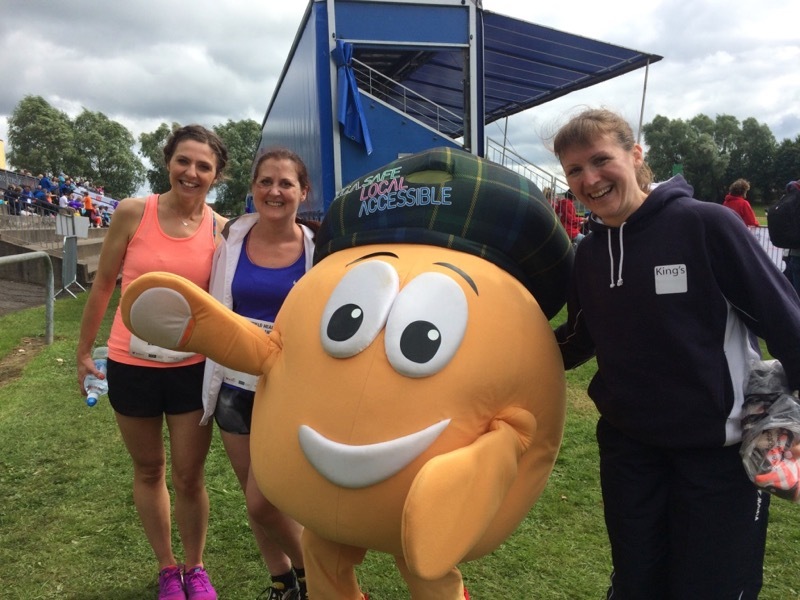 That’s the other thing – I always end up chatting to people more in trail races than road, and I kept catching up with David throughout the race and saying hello. As I meant to treat this as a training run rather than a race, I set off thinking I’d keep the pace relaxed and just enjoy myself and the gorgeous scenery and spring flowers. I wasn’t vigilant about staying in heart rate Zone 2, but I didn’t want it to go too high either, mind. Once the route finally left the motorway, it was all trail and logging roads, and a ton of hills! Now, I’ll take an undulating course over a flat one any day as I just think the variation is more interesting, but in the spirit of keeping my heart rate down, I opted to walk up nearly all of the hills. This meant that I was passed by a few stalwarts chugging away up the hill, but in every single occasion, once I reached the top of the hill feeling fresh as a daisy, I’d blow past them and never see them again. So what started off as a “preserve the HR” strategy actually ended up being a speed strategy! For years I was that runner who thought that walking was giving up, but seriously, I’m won over to the ultra mindset now – walking up hills frees you up to be able to run harder on the flats and downhills, plus gives you an opportunity to eat or drink and actually get it down. It just makes sense. What started off as a training run mindset gradually ended up morphing into “just let the legs do what they want to do” run instead, so at times that meant walking, but at other times it meant just letting loose like a Kenyan. 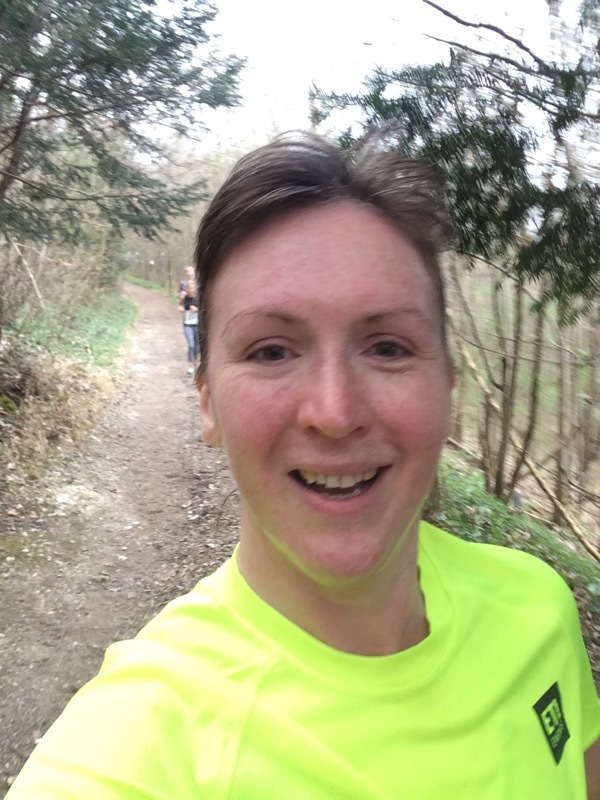 I think this freedom from a set pace goal plus the gorgeous woodland scenery went a long way towards this being one of my most enjoyable runs for ages. 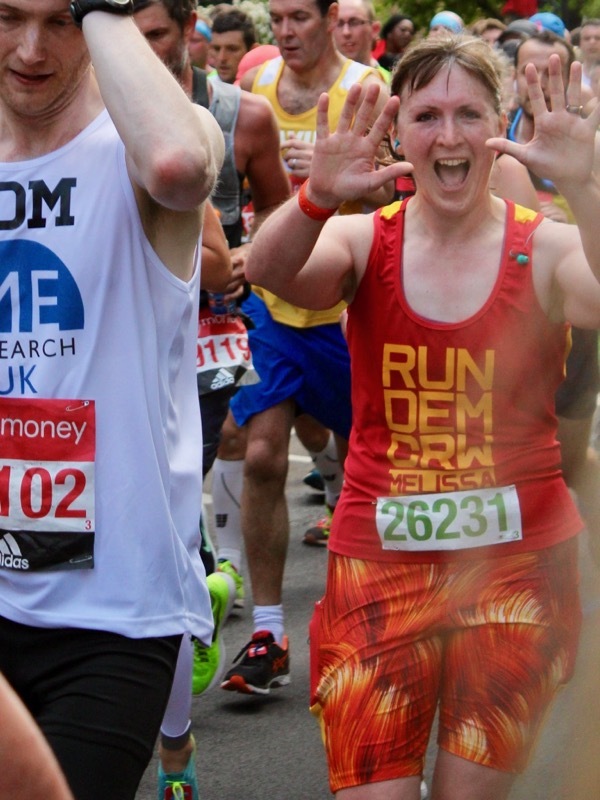 I also noticed that, just like in Cambridge, I caught a second wind around Mile 10 or so and just flew, really easy strides, passing people left and right (including David, who I’d been just behind for most of the race) and just feeling like it had all come together. I continued that streak into a sprint across the finish line with 1:56 on the clock, then turned around to cheer rather than join the teeshirt queue just to see if my new friend would make it in time. I waited what felt like an eternity, cheered in a few more runners, and there he was, finishing in 1:58 with a massive grin on his face. There weren’t any medals for this race, but instead we got a lovely teeshirt (which I’ll actually wear and cherish! ), plus a bottle of beer and chocolate and biscuits galore (not seen in photo – already eaten!). Which isn’t quite the post-race hog roast and wine that Bacchus delivers, but an awfully fine end to a fine, fine race. And if Events to Live had to pick a final race in order to move on to new things, then they couldn’t have gone out on a bigger high. They’ve created quite a legacy in the Surrey trail running world, and they will be sorely missed. 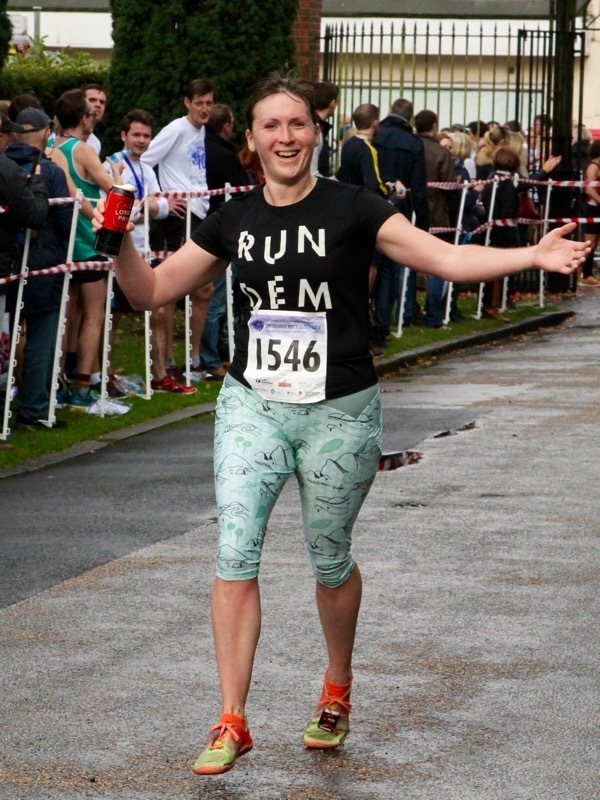 I never quite got around to giving you all a winter training update (what can I say, running your own business whilst marathon training really leaves little time for anything else! ), but the short version is that it’s been going well. After putting on a few extra pounds over Christmas and generally feeling “blah”, I returned to my good friend Maffetone in a big way. Low-carb isn’t the enemy of endurance training, it turns out, and I highly recommend the book Primal Endurance as a good blueprint for how to maximise training gains while eating low-carb. I even bought a copy of it for my coach so she can adjust my marathon training plan a bit, as I’ve been struggling with interval work in the meantime. 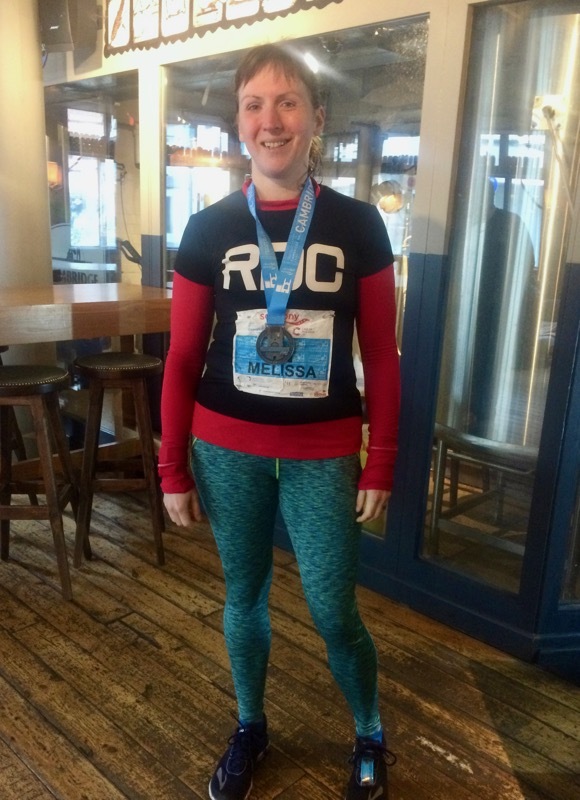 I only mention this as it’s tangentially important to lessons learned during the Cambridge half. Much more relevant, though, is my medical history, as I’ve had two separate illnesses during training – a head cold in January that miraculously only lasted a week (since my transplant, I’m lucky if I’m over a bug in 3 weeks! ), and a sinus infection that left me in bed and hopped up on Night Nurse the week leading up to this race. 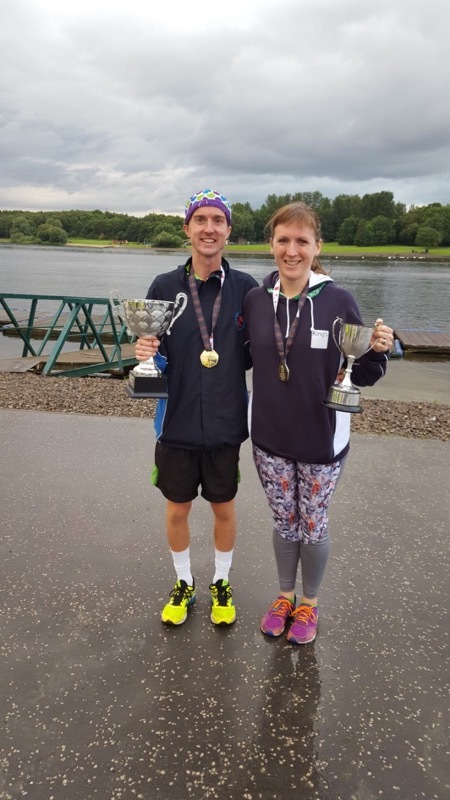 Granted, I did start to feel a bit perkier on Friday and Saturday, but earlier in the week it was looking like I’d not even be able to party pace it, let alone gun for the PB as I’d hoped. But with my energy levels back up to about 80% and some well-planned nose blowing the morning of the race, I had re-aligned my expectations again to try and treat it as a solid training run. The weather forecast deteriorated as my health improved, however, leaving us with freezing temperatures (6C), pouring rain, and high winds on race morning. Luckily I came prepared – full leggings, thermal long-sleeved top (with hand mitts! ), and RDC shirt to run in, plus a sacrificial jumper and hat for the start as well as the ever-chic binbag to keep the wind and rain off (don’t knock it til you’ve tried it!). 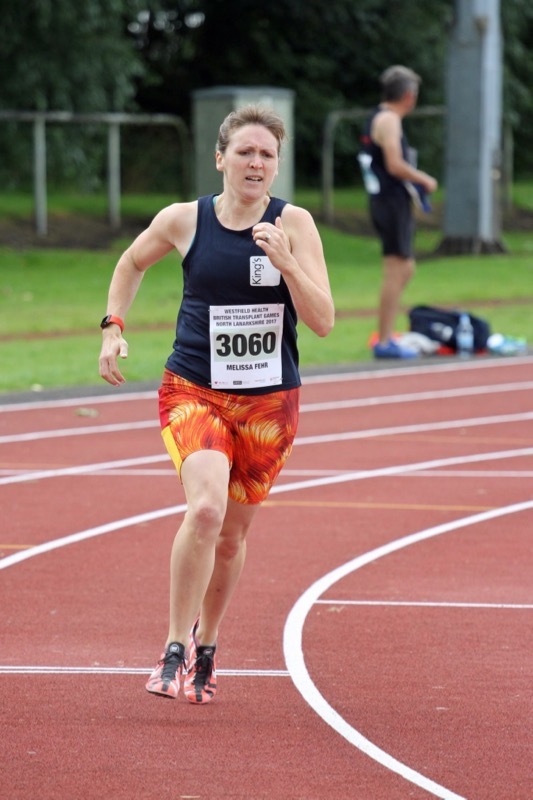 A sub-1:45 predicted finish placed me in the fastest start pen with the bulk of the club runners, so I positioned myself near the back and mentally prepared myself to be overtaken a lot. The rain came lashing down almost the second we started, which helped to keep me from getting too excited in the first few miles, as did the general crowding through the one-lane sections through the city centre. Since my AppleWatch (running Runmeter) was under my long sleeve, I generally ran this race on feel for “comfortably hard”/tempo pace, and only pulled up my sleeve to check my actual pace a handful of times (and was generally pleased that I was going faster than I’d thought). When I previously ran this race in 2015 it was comprised of two loops, mostly through town, but last year they switched to a single-loop course to increase the numbers (as single loops can take the full width of road instead of splitting in half for Lap One / Lap Two runners). The route now starts and ends on Midsummer Common, goes through the city centre and past Kings College, then heads out into the countryside to Trumpington and back around before taking some nice twisty-turny bits through town and then repeating the first 2-3 miles of the race to finish at Midsummer Common again. I personally give the new route two thumbs up – I really like two lap courses in unfamiliar towns as I visually know how far I’ve got to go the second time around, but repeating the first/last few miles of the course serves the same purpose for me, and I quite liked seeing a bit of countryside and fields, even if they were really windy and sparsely supported. Speaking of support, my favourite cheerer of the day was a little dog riding in its owner’s front bike basket, barking support as his owner rode alongside the runners! Very Cambridge. As for my race, I continued along at my “comfortably hard” pace for the first 7 miles with no real issues. 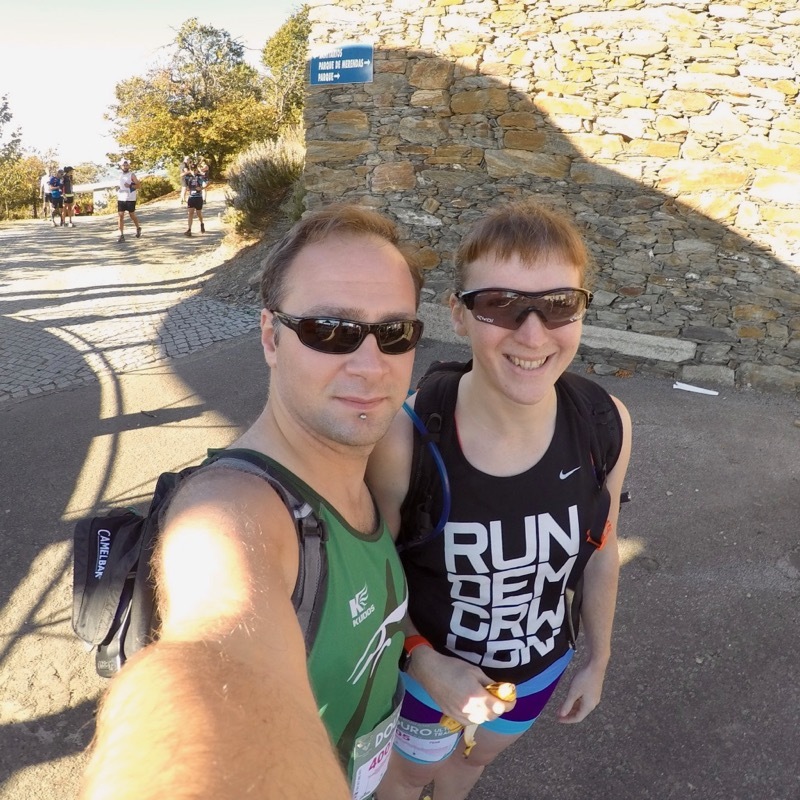 I ran into my friend Ben from RDC just before Mile 6 and ran with him for a few minutes before he needed to stop and stretch out his ankle, but I was otherwise on my own and without headphones (as per race rules). I only grabbed a few sips of water at the stations at Miles 2 and 6, but when I hit Mile 7 I could feel myself dimming and knew I’d need to grab a gel at the Mile 8 station (thankfully they were High 5 isotonic, a brand I’d tried and liked in the past). My months of training under my cardio heart rate threshold had done wonders for my fat-burning ability, but at the pace I was going I know my body would be consuming a mix of fat and glycogen, and at Mile 7 the glycogen stores were just a bit too low. But the gel at Mile 8 (and half of another at Mile 10) really did the trick, gave me a sugar high (it’s been so long since I’ve eaten anything sugar that carrots honestly taste sweet! ), and helped me to glide on through to the finish maintaining that same pace. So now I know that I can easily go a good 6 miles at slightly-faster-than-marathon-pace without the need for fuelling, so I can plan my nutrition for London marathon accordingly. Even though I was overtaken quite a bit at the start of the race (and the 1:45 pacers when I stopped to open my gel packet at Mile 10), I ended up passing a ton of people in the last few miles, as normally happens when you pace a race well. This is always a terrific boost no matter what the distance, and I sprinted the last few hundred meters to eek out a time of 1:45:59. Now, this is a full 9 minutes slower than my PB (set at Bath Half in 2014), but considering I was still nursing a sinus infection and fiddling with low carb training, I feel that’s a time I can really be proud of. 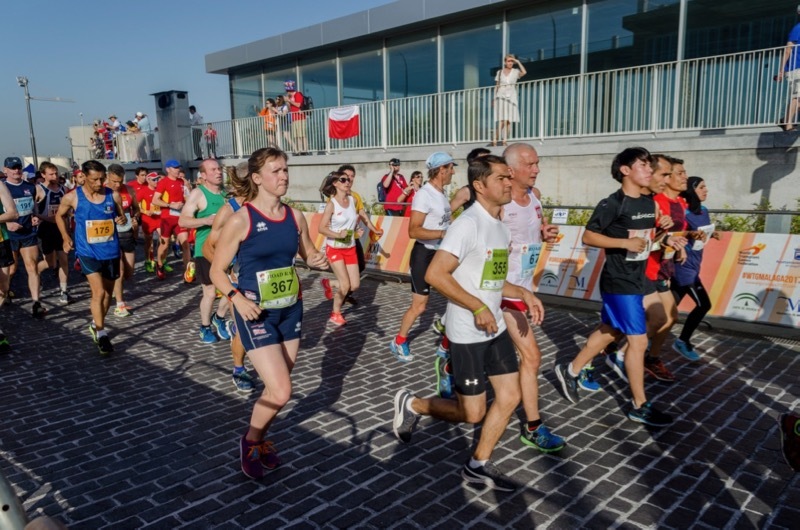 Coming into the race, I’d felt that my planned marathon pace of 5:00/km (8min/mi) was still nowhere near comfortable, yet during this race I maintained an average 4:50/km and felt good. So on top of the nutritional lessons, I’m feeling much more confident that I can maintain my planned marathon pace, especially with another month and a half of training, strength work, and a bit of weight loss, besides. In fact, the only downside to the entire race was after it ended. The race numbers were allocated based on estimated finish time (so low numbers = faster runners) and the baggage tents were organised based on race number… meaning that everyone finishing at the same time had to join a massive queue for one or two handlers, while the rest sat empty. This would’ve been merely frustrating if not for the fact that it was freezing, we were all wet, not given space blankets, and the VIP area placement made it impossible to distinguish any of the queues from each other. A whippet-thin runner in front of me was literally convulsing with cold and everyone was getting numb in the 30-50min wait to get to whatever dry clothes they’d packed in their kit bags. I don’t know how the organisers could’ve done the bag check so brilliantly in the past yet made such a stupid mistake this year, but seriously guys – BAGGAGE CHECK BASED ON SURNAME. Or assign race numbers randomly. One of the two – it’s not difficult. It’s a real shame that the frankly dangerous baggage chaos put a downer on an otherwise excellent race. Assuming they’ll take my advice above for next year, it’s a race I can definitely recommend. 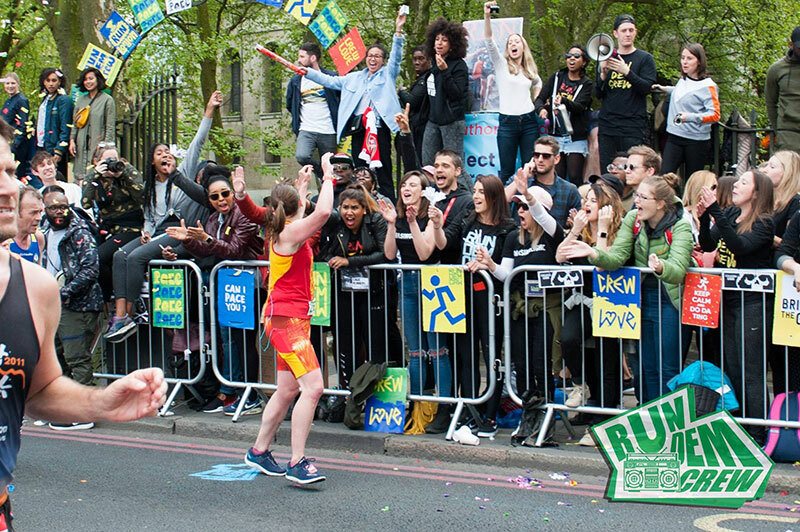 It’s great timing for spring marathon training, close to London, cheap (so long as you can snag a place the second they go on sale! 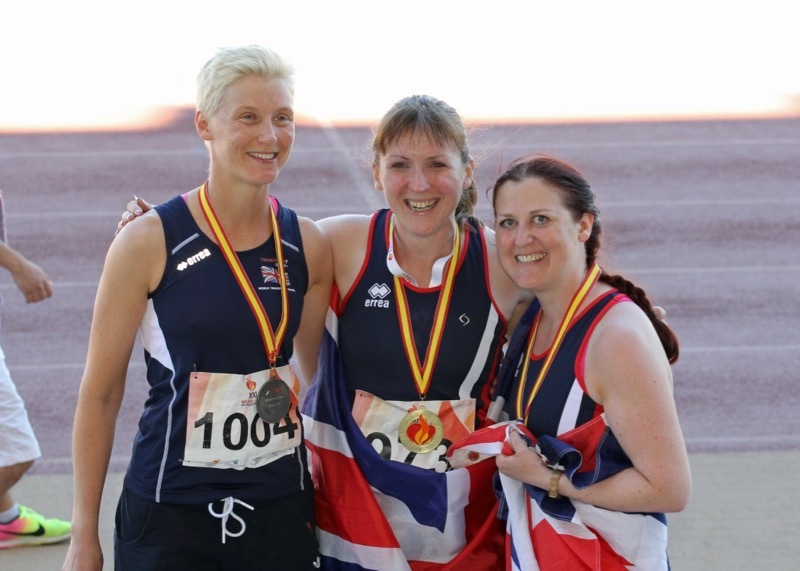 ), well organised, with a hefty medal, and great pubs nearby to warm up in afterwards.